As I've mentioned, we pretty much gave up on fine dining in Sydney after lackluster and overpriced meals at all the heavy hitters: Quay, Tetsuya, Sepia, Marque, Becasse. Believe me, I tried to do fine dining in Sydney! So on this visit, we focused on casual restaurants, and had much better success. But, for our last lunch in town this time around, we decided to go to a fancy meal. The motivation was a bit silly actually: I wanted to eat kangaroo. They served kangaroo in my office cafe on a prior visit, and really liked it, so I figured if our office cafe could do it well, a nice restaurant would do it even better. And where do you find kangaroo on menus in the US? But, contrary to my stereotypical expectations, I didn't find roo offered in many places in Sydney either. After looking at a slew of menus, I finally found one place that was well regarded and served kangaroo: Bentley Bar and Restaurant. Except, I was confused, it was located in the CBD, in the Radisson Blu hotel. I could have sworn I knew a restaurant by that name in Surry Hills. A little research revealed the answer. Both were right. 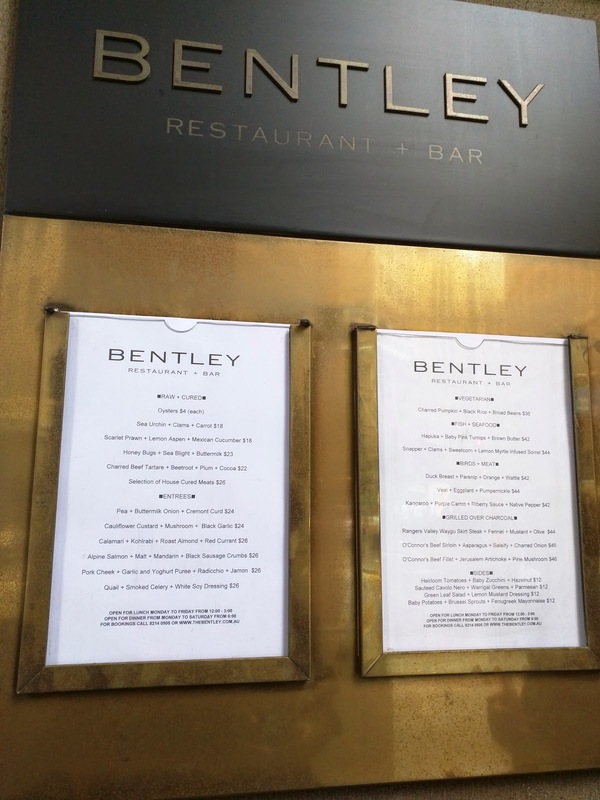 Bentley used to be located in Surry Hills, but moved. Interestingly, I never visited the Surry Hills location, even though I lived there for 3 months, and literally walked by every single day. Anyway, back to Bentley. Unlike all the rest of our dining on this trip, Bentley is a fancy, pricy place. We knew this going in, and everyone suited up accordingly; I even put on a dress. We opted for lunch rather than dinner mostly because we just couldn't fit it into our dinner schedule, and the same menu is served, so we weren't missing out. Lunch is clearly catered to the business crowd, everyone was in suits, in groups of about 4, which I guess makes sense at this price point. No one just casually swings in for lunch. We were seated next to a party of 20ish, which was impressive to watch. The restaurant did a great job of serving them all simultaneously! Service was good throughout our meal, very attentive, but I did have a few complaints. First, dishes were just set down and the name from menu was repeated with no further explanation. Given how highly conceptualized the dishes were, I would have really liked a better understanding as to what it was I eating. Second, the pacing was off. 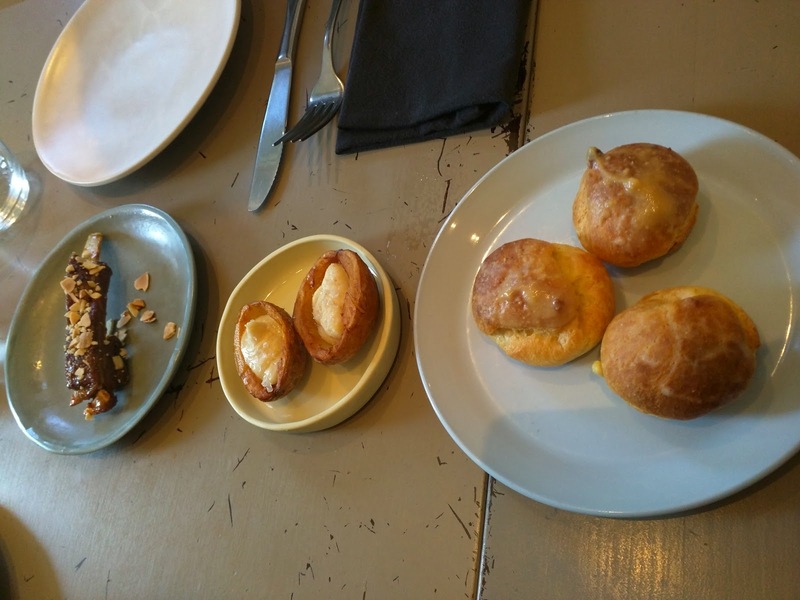 It started off rapidly: bread came before we even ordered, our amuse bouche arrived shortly thereafter, and our first course was served within a reasonable amount of time. All fine so far. But the lag before our mains was substantial, and the lag before our desserts even more so. Our 3 course lunch took nearly 2.5 hours, which we were not expecting, given that we were supposed to be at work. Not really business lunch appropriate. 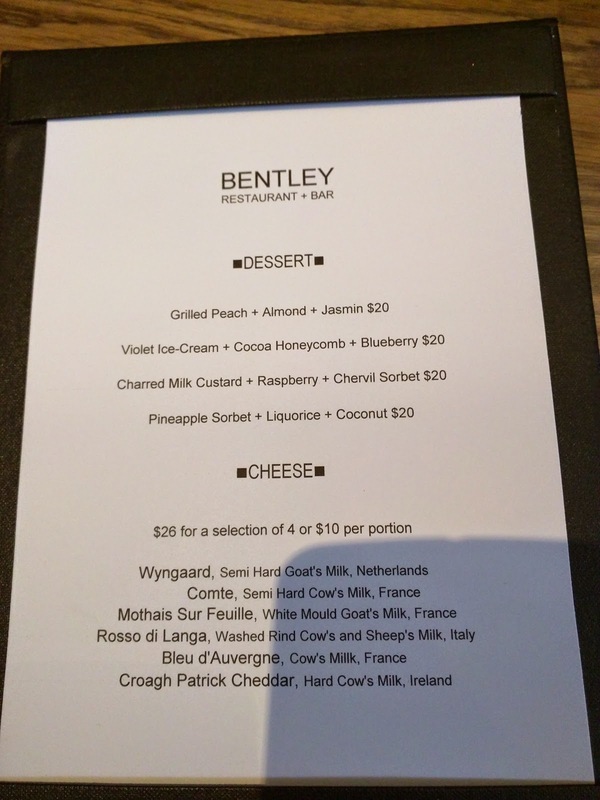 Anyway, Bentley was more successful than other fine dining we did in Sydney over the years, but it still wasn't the best food we had. If I wanted a good meal, I'd just go back to Pinbone, the clear winner of the trip. It is hard to pinpoint exactly what didn't wow me about Bentley. The quality of the ingredients was evident, and I can't fault the execution of anything: every protein, every vegetable, everything was cooked correctly. The plating was all well done. But, I didn't love anything. There were no memorable dishes. No perfect bites. Most dishes had an element or two that felt like they were just trying too hard. I'm used to elaborate techniques (foams, gels, mousses, snows, etc), so it wasn't the concept of this style of cuisine that didn't work for me, nor the complexity of the dishes, it was that these specific dishes just weren't particularly tasty. Again, everything was fine, but at this price point, I expected more. The space is broken into two levels. 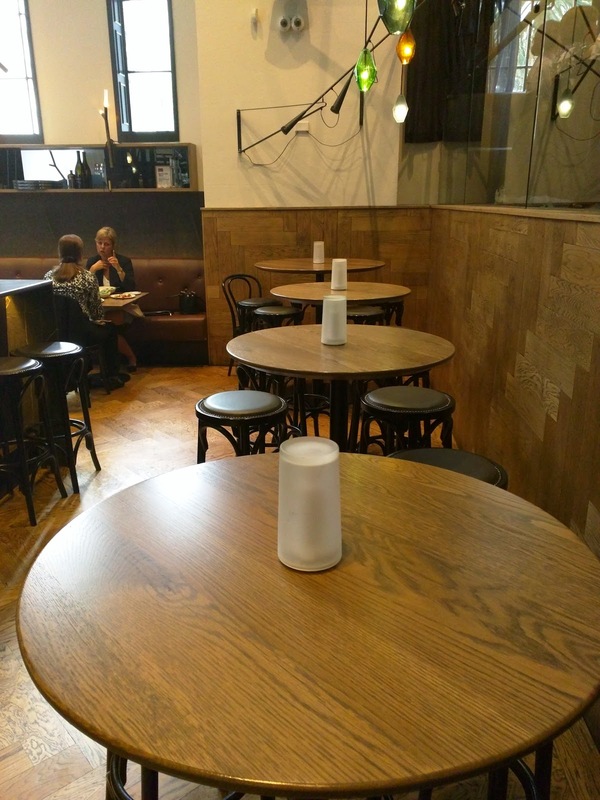 On the first floor entry level are small tables for walk-in bar seating, where they also serve a slightly different menu. I imagine in the evening this is a bustling place. For business lunch however, it was largely vacant. There is also the actual bar, with a few stools, again, vacant mid-day. The downstairs space is completed by an open kitchen, which I enjoyed watching from my perch in the dining room above. I'm always fascinated by watching kitchens in action. We were one of the first parties seated right at 12pm, and it was fun watching as the kitchen swung into action. Things started off slow, but the pace quickly accelerated. The staff never seemed frantic though, although they were in constant action by the end. At one point, I saw a huge blow torch come out, a sign of all the advanced techniques that were to come. The new space is much swankier than the space in Surry Hills, decorated in black tones, offset by plenty of light from huge windows. It is an architecturally interesting space. I wonder what the ambiance is like in the evening, but during the day, it was quite light, even with the dark accents. The kitchen and bar are on the first floor, but the dining area, and wine room, are upstairs, overlooking the first floor. 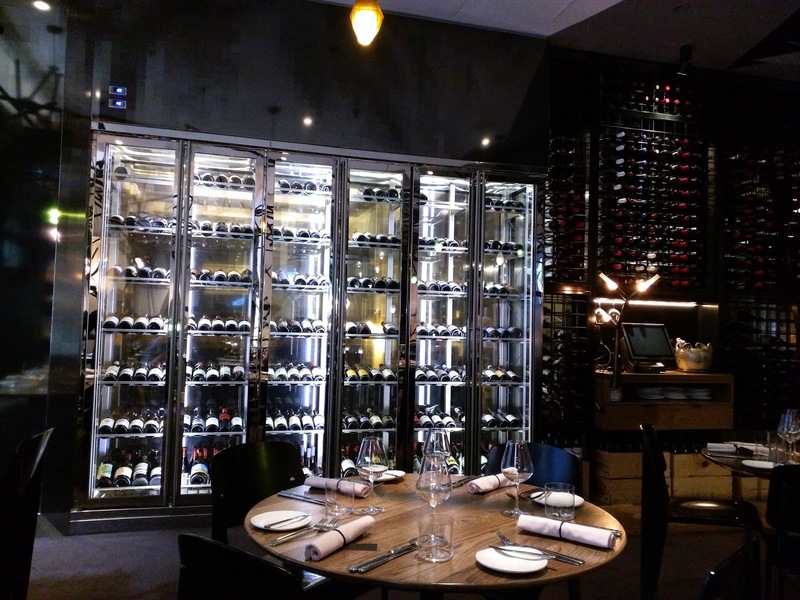 The main feature of the dining room is the huge wine room, on display just like the kitchen. If I were there for a boring business lunch, I certainly would have had plenty to look at in this environment. 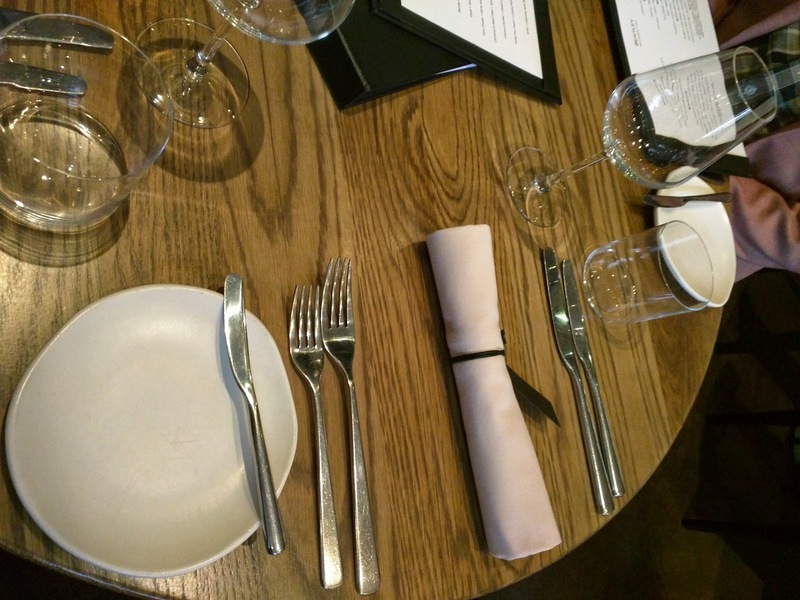 Tables are wooden and set with classic fine dining settings: two forks, two knives, bread plate with butter knife, but no table cloth. The napkins were tied with a twine, which was really annoying. The person seating us made a point of picking them all up and untying them one by one, so it isn't like we had to do it, but still, annoying. Looks over functionality, a bit of a sign of what was to come. 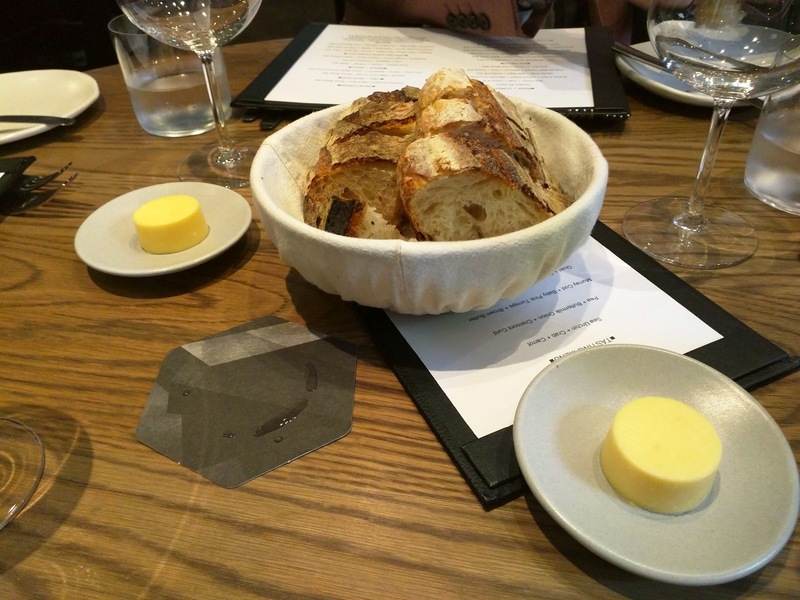 Before we even ordered, bread and butter were brought to the table. I could smell the sourdough the moment the bread was placed down, so I avoided it completely. I hate sourdough, and don't understand how it followed me from San Francisco to Sydney! They don't bake the bread themselves, but source from a local bakery, Iggy's, and proudly tout this fact. My dining companions enjoyed it, and our bread basket was quickly devoured. A replacement was offered, but we declined. As a higher end restaurant, Bentley offers a 10 course tasting menu for $150, available at lunch or dinner. A vegetarian version is available for $130. But we were there for a slightly more casual affair, and decided to order a la carte. The a la carte menu is broken into Starters, Entrees, Mains, Sides, and Desserts. From what I could tell, starters are lighter, mostly raw or cured, and a bit smaller than the Entrees. Starters ranged from $18-26. For mains, there was a single vegetarian option: Charred Pumpkin + Black Rice + Broad Beans, for $36. The rest of the mains were priced $42-46, broken down by type of protein. I'll get to the dessert menu later on. As you can see, the dishes were all listed as 3-4 ingredients, leaving much up to our imaginations. 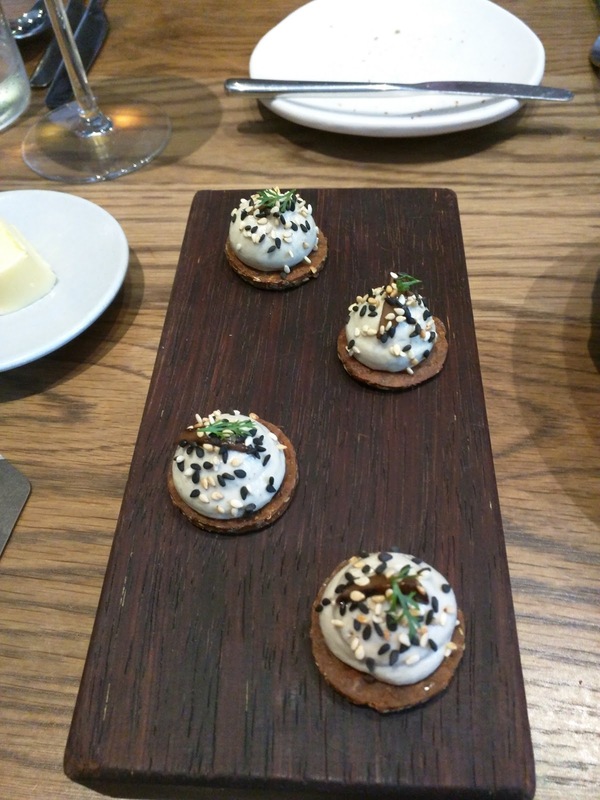 Immediately after ordering, we were presented with an amuse bouche. I wasn't expecting this at lunch, but, since the menu is the same as dinner, it does make sense. The amuse was a linseed toast, with a shiitake eggplant custard, and sesame seeds on top. It was a delightful bite. The base was crunchy and hearty. The custard was creamy and smoky. The sesame seeds on top added an extra pop of crunch. We all really enjoyed this, and commented on how it was what we always wanted baba ganoush to be. It really was like the most flavorful baba ganoush we'd ever had, served on a tasty little cracker. My second favorite dish of the meal. Starter: Sea Urchin + Crab + Carrot. $18. For my starter, I had to go for the "Sea Urchin + Crab + Carrot". As you know, I love uni. I love crab. So I was thrilled to see the two items together on the menu, even though I had no idea what to expect. The dish was set down in front of me. "Sea urchin, crab, and carrot" the server said. I looked. I saw no urchin, but I figured I'd find it as I dug into the dish. The carrots were evident, piled in large shreds. Underneath this was a very sweet orange sauce that I believe was also carrot. In the sauce was little chunks of crab, quite delicate. The right hand side of the plate was ... snow. It was cold and icy, not what I was expecting! I'm assuming the urchin was in here, but honestly, I didn't taste it. I wanted lobes of uni, but if I wasn't going to have full lobes evident, I at least expected to taste the strong, distinct taste of uni. Sadness. This dish was not at all what I was expecting. It was light, a good ease into a meal, and the crab was fine, but it didn't come together for me. I didn't want icy snow, and I didn't want huge shreds of carrot. My 5th pick of the night, and I clearly wouldn't get this again. Starter: Honeybugs + Sea Blight + Buttermilk. $23. Ojan opted for the "Honeybugs + Sea Blight + Buttermilk". Well, to be fair, I think I may have made an executive decision that he order this, just because we were really, really curious. Doesn't it sound a bit horrible? Bugs and blight? Tasty! The honeybugs turned out to be quite tender actually, well cooked. But they were served on top of a very creamy and tangy buttermilk sauce that totally overwhelmed the dish. I wanted to actually taste the honeybugs and understand them, but the buttermilk just took over. The sea blight (a seaweed) was my favorite component, served in fairly large chunks, a bit crunchy, nicely charred. I loved the charred flavor, and it somewhat reminded me of hearty Hen Of The Woods mushrooms. I liked this much more than the crab and urchin dish, solely based on the tasty sea blight. It was my third pick overall. Price was perhaps a bit high for such a small dish. Entree: Calamari + Kohlrabi + Roast Almond + Red Currant. $26. Throughout the trip, I was hooked on calamari and squid. They seemed to show up on nearly every single menu, and not just fried (although, there was plenty of fried seafood too). While not rare in the US, they certainly aren't as common here as they seemed in Sydney. And, it seems, the chefs in Sydney know how to properly prepare them, not just resulting in rubbery, tough pieces. Thus, the calamari entree kept calling out at me. But, in our group of four, one person opted to skip all starters and entrees, and order just a main dish. The other, a vegetarian, ordered a starter and an entree, since he didn't care for the single vegetarian main option. Ojan and I were already each ordering ordering a starter, and I knew we wanted the kangaroo main, and we all wanted dessert ... but I wanted this too. It didn't seem right for us to do 4 courses, while others did only 1 or 2 (not that I really wanted a 4 course meal). So, I decided to order the calamari entree as my main, particularly as it sounded better than the seafood mains anyway. This was the best decision I made all day. The calamari was excellent. It was grilled, with visible grill marks, and the pieces were rolled into little curls. Like the eggplant in the amuse bouche, and the sea blight in the starter, it had a lovely smoky flavor. Expertly prepared. The kohlrabi was four slices, also rolled up. Light and crunchy, a bit bitter, fresh and tasty. I believe the roast almond was the light sauce in the bottom, that reminded me slightly of a miso paste, a bit salty and sweet. The red currants weren't particularly interesting, just a few scattered in the dish. This was my favorite of the savory dishes, hands down. I liked the smoky flavor contrasting with the sweet and salty, and the delicate nature of the entire dish. $26 was again a bit high for the portion size, although as an entree, it was bigger than the starters, and with an amuse bouche, a starter, and dessert on its way, was certainly large enough to satisfy me. Entree: Cauliflower Custard + Mushroom + Black Garlic. $24. Our vegetarian diner also ordered an entree for his main. 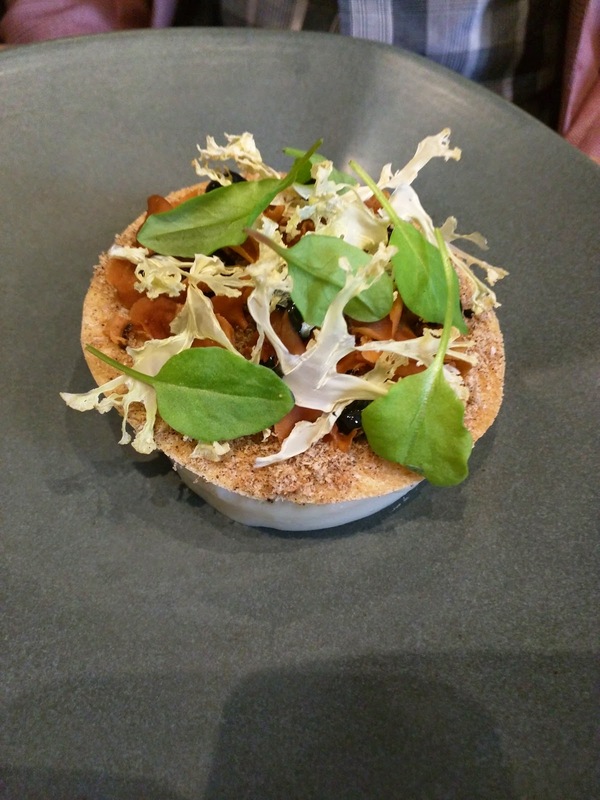 If I was able to pick another dish for myself, I would have selected this, as I love custards, mushrooms, and black garlic, so I was glad he ordered it. On the bottom was the cauliflower custard along with some mushrooms, but on top of that was a crispy component, that he found hard to break through, plus some other soft ingredients. It was fascinating, but he grew wary of the difficulty of eating it, and deconstructed it for ease of eating. I stole a bite of the custard, and thought it was creamy and tasty, the cauliflower flavor quite strong. I think the texture from the crunchy layer probably would have been nice to contrast against it, so I imagine I would have actually enjoyed this dish, but the person who ordered it seemed less than trilled. 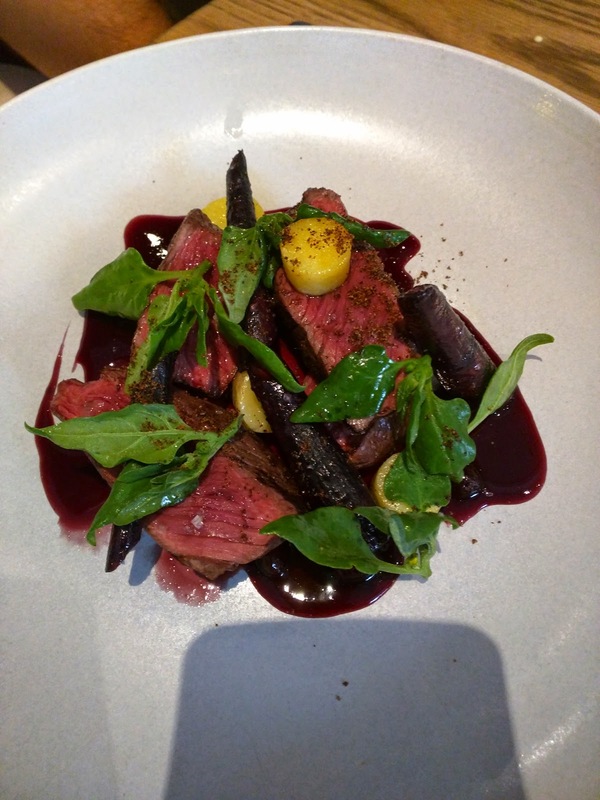 Main: Kangaroo + Purple Carrot + Riberry Sauce + Native Pepper. $42. And finally, the reason we were there: the kangaroo. They also had a number of beef dishes available, and a duck that our other diner ordered, but, I was there for one thing: kangaroo! The kangaroo was just how I remembered it. A tender, lean meat, not very gamey. They cooked it a nice mid-rare. The sauce was made from riberry, a native Australian bush ingredient, that was quite tasty and sweet, and went nicely with the meat. I believe the greens on top were the native pepper leaves. I really appreciated how they used all native Australian ingredients alongside the kangaroo. The preparation of this dish was far less innovative than the others. The purple carrots were just roasted carrots. There were also some slices of potatoes, again, just roasted. This was all fine, and again, well prepared, but I didn't love it, making it my forth pick overall. As a main, it was certainly much larger than the other courses, with three large slices of the kangaroo. And finally, dessert time! I was actually quite full at this point, and no one really seemed interested in dessert, but I just couldn't pass it up. Julie doesn't know how to NOT order dessert. Plus an assortment of cheeses, available as a selection of 4, or individually. The dessert I read about in my research was the violet ice cream, so I wanted to order that, and others put in a vote for the charred milk custard, in the same way we all wanted the honeybugs and sea blight ... it just sounded a bit odd, so, why not try it? To go along with the dessert, I also ordered a decaf long black, as I love pairing black coffee with sweet desserts. The coffee came not too long after we ordered, but our desserts too a really, really long time to arrive. I actually wished at one point that we had decided not to order dessert and had just gone back to the office, as this meal was taking far longer than I expected. I didn't time it, but I wouldn't have been shocked if it was at least 40 minutes from the time we ordered desserts until they arrived. My coffee was long gone by then. 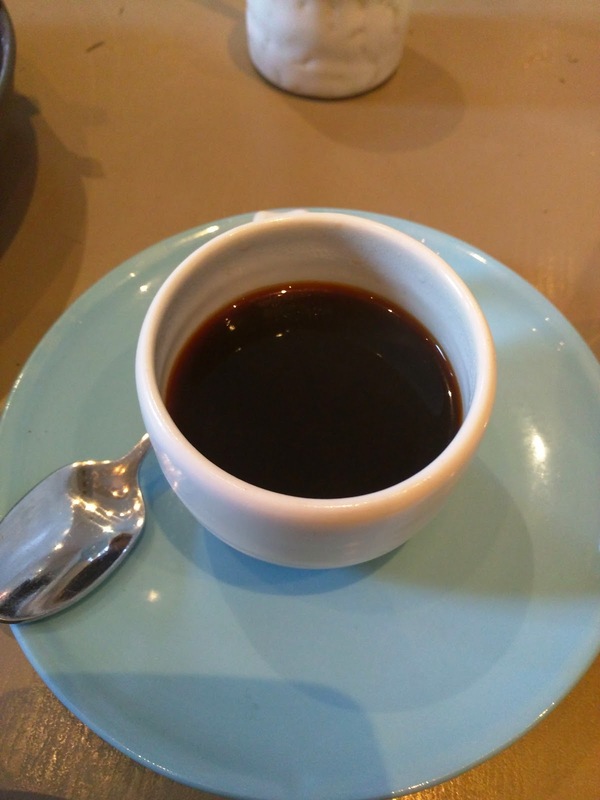 The coffee was served in a little cup without a handle. It was really hot, the cup included. This made it quite difficult to drink. Presentation trumps enjoyability, again. The coffee was fine, but, I struggled with holding it while it was hot, so I tried to drink it slowly so I'd have some with my dessert, but alas, that was a lost cause. 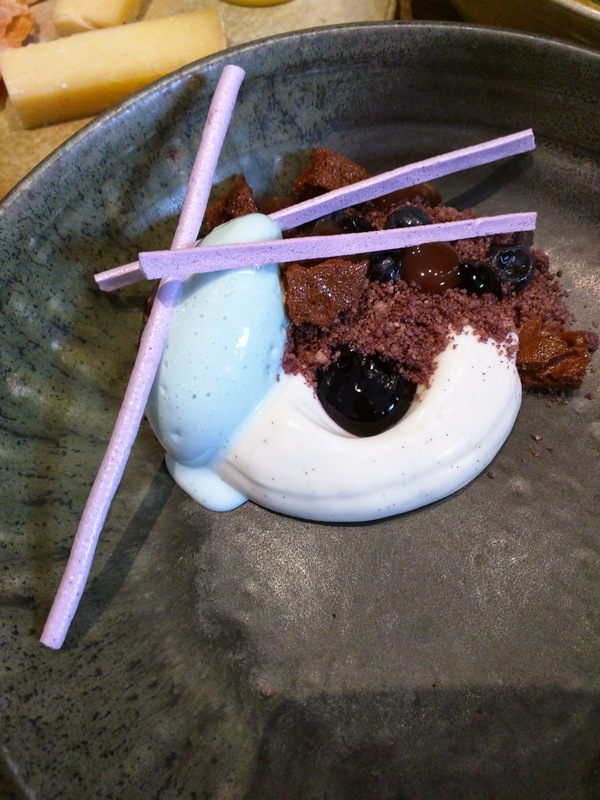 Dessert: Violet Ice-Cream + Cocoa Honeycomb + Blueberry. $20. And finally, our long awaited dessert. The violet ice cream was creamy and mildly sweet. I didn't taste violet exactly, although, I'm not sure I know precisely what violet actually tastes like. The blueberry was both a jam and fresh berries, and I liked them for the color, but otherwise, they weren't particularly interesting. The cocoa honeycomb was my favorite component, crunchy and sweet. I'm a textures girl, so I really liked having something crunchy with the creamy elements, plus, it was really just quite good. I like honeycomb and always eat as much as possible in Australia (like in the butter at Bills!) since we don't really have it here in the US, but this was my first time having chocolate honeycomb. Interestingly, the primary element of this dish was not one of the listed ingredients. In the center pf the dish was a cream (the violet ice cream was just the quenelle on the side, not the large mound in the middle). The cream was strangely thick and a bit off putting in its texture, and very tangy. Like the buttermilk in the earlier dish, I felt this tang just took over from the other flavors, and, in the case of this dessert, cut the sweet too much. No one else liked this, so I ended up eating most of it, but I didn't love it, and wouldn't order it again. Dessert: Charred Milk Custard + Raspberry + Chervil Sorbet. $20. And finally, the curiosity dessert. It was just as fascinating as anticipated. The charred milk custard was the most unique element, I appreciated the creamy aspect, and yes, it indeed tasted charred! And ... I liked that flavor. As you can tell, the theme of grilling and smoky elements is what I enjoyed throughout the meal, from the smoky eggplant amuse, to the grilled sea blight and calamari, to this. I guess I was in a smoky mood? The chervil sorbet was ... very herby. It tasted incredibly healthy. No one else liked this at all. One bite and they were all done. I was ready to follow suit, but ... I can't waste dessert! It actually grew on me over time, until I reached a point where I appreciated its lightness and refreshing qualities, and yes, I somehow finished this one too. Yes, I have a dessert problem. 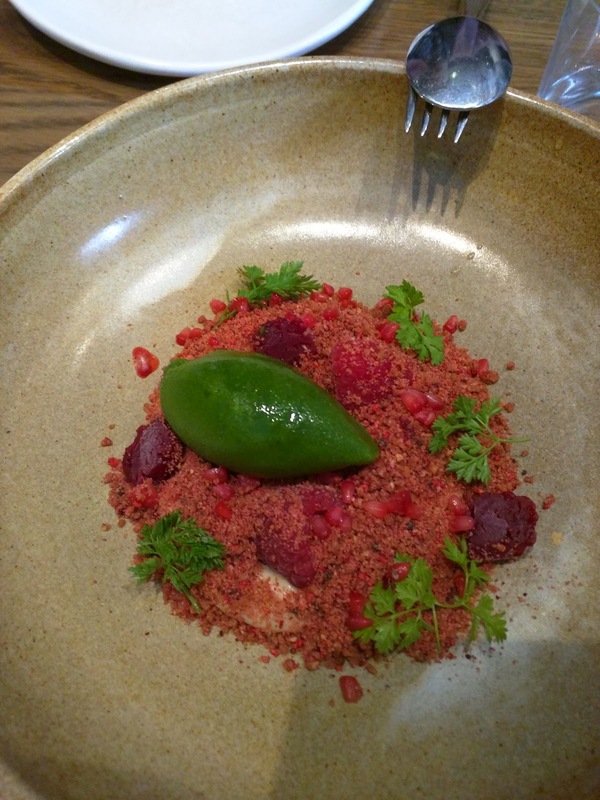 This dish reminded me of the Evergreen dessert from Lumi, with its sorrel sorbet and microgreen garnish, that we had on our first night in Sydney, in that it was a very herby, light dish, incorporating greens into a sorbet and a dessert, but I liked this more. Dessert: Croagh Patrick Cheddar, Hard Cow’s Milk, Ireland. $10. Our vegetarian diner was still a bit hungry and wanted some protein, so he ordered one of the cheeses. 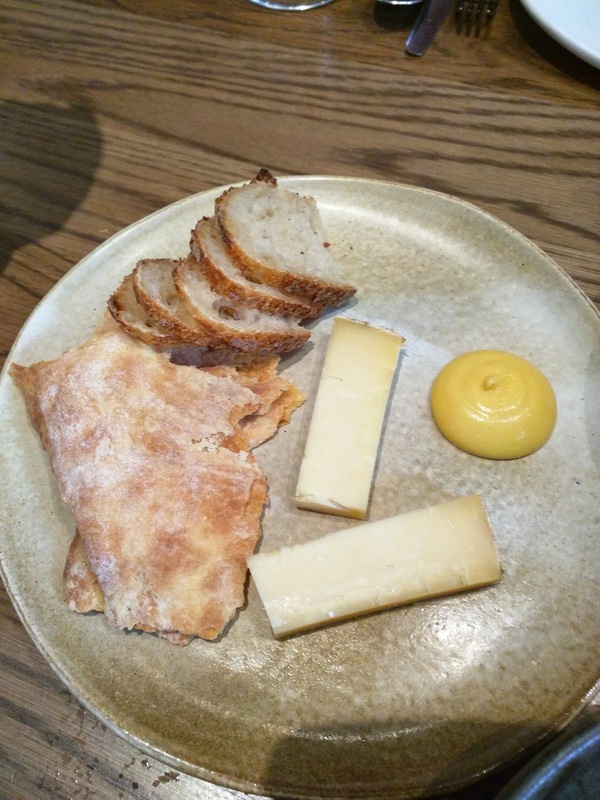 It came served with both toasted bread and crackers, plus what we decided must be lemon curd. I only nibbled on a cracker and dipped it in the curd just to try it, but the others did like the cheese. 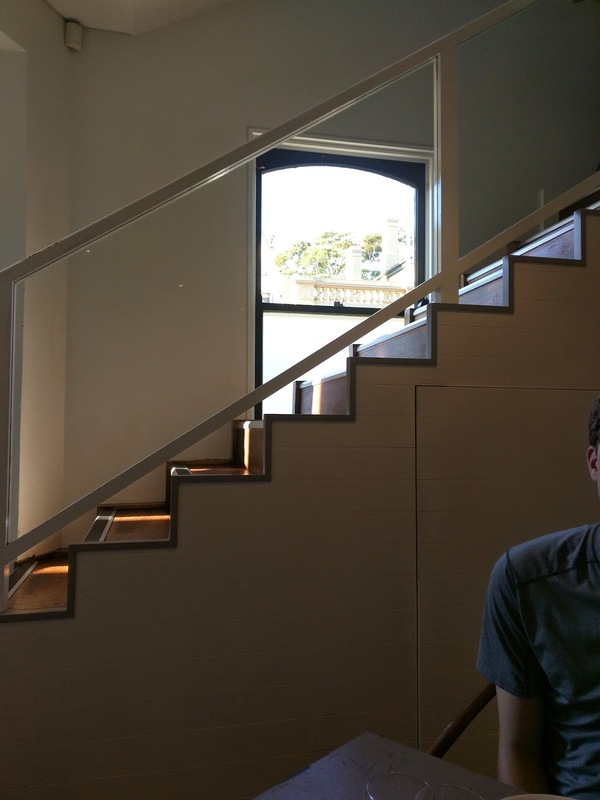 On my second-to-last night in Sydney, I visited Pinbone for Saturday dinner. It turned out to be the best meal we had in Sydney, no question. 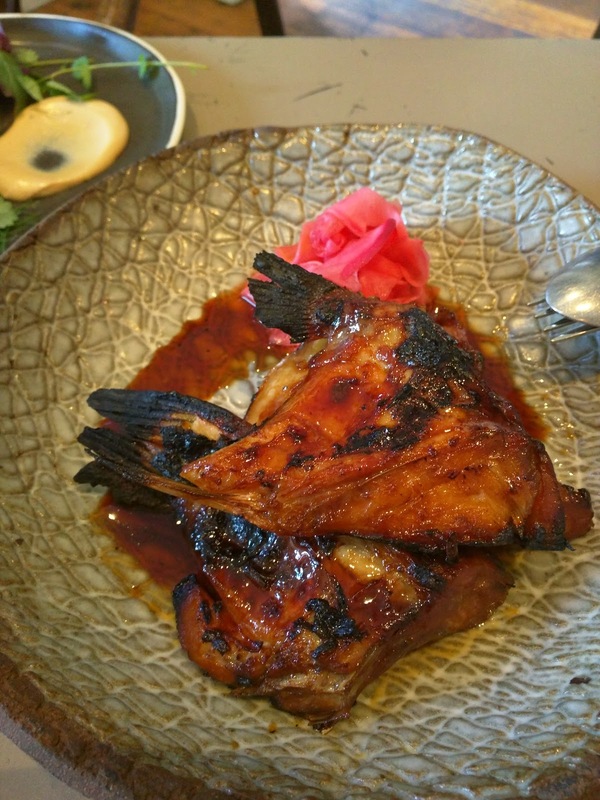 I was devastated that I didn't discover it earlier in the 3 week trip, as I wanted to try many more dishes on the menu, and would have gladly returned multiple times. As I said, we went the second-to-last night, which means we had one night left, and I would have returned that night, but alas, they are not open for dinner on Sundays, and so I had no more chances to visit ... for dinner. 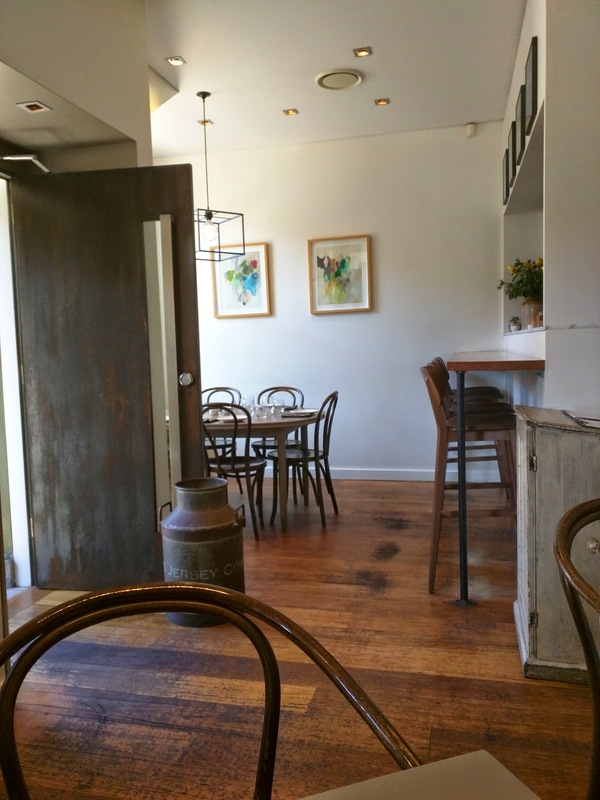 Pinbone mainly serves dinner (Wed-Sat), but it is open one other time: Sunday brunch! 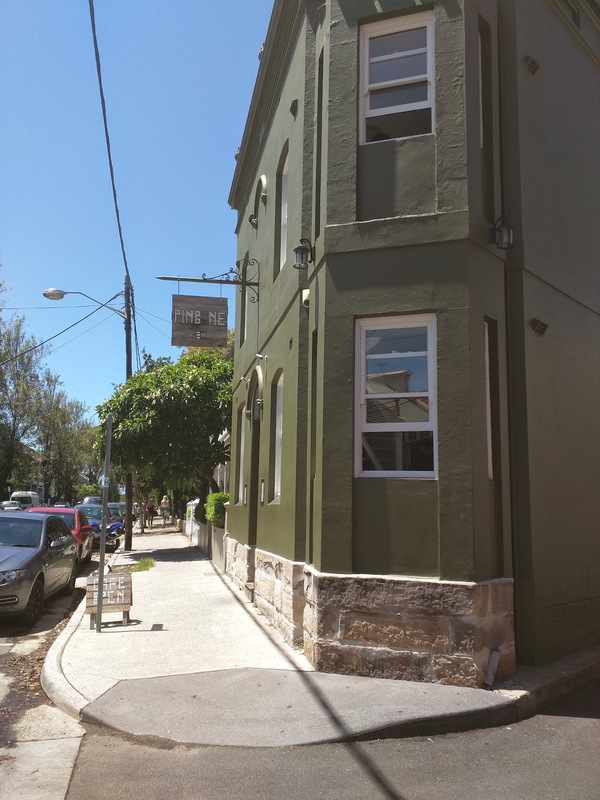 Of course, I'm a planner, and we already had brunch plans for our final brunch at other past Sydney favorites, but about two bites into our dinner at Pinbone, I declared that we needed to cancel our plans, and return the next morning. The others weren't necessarily sold on venturing all the way back to Woollahra, particularly when there were other places they did want to go that were far more convenient. I was still scheming to make it happen, so I asked to see the brunch menu before we left. I was sold. I didn't care if no one else joined me, I was returning to Pinbone the next morning. I needed that brunch. In the end, Ojan agreed to join, but the others did not. 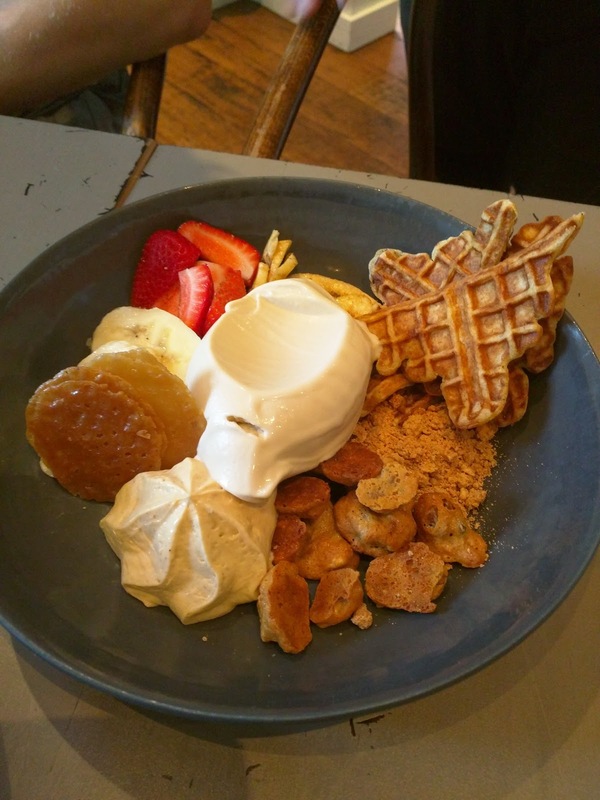 Spoiler alert: everyone else missed out on the best brunch I had in Sydney, and one of the best brunches of my life. Now, you know how much I love brunch. It truly is my favorite meal. I'm an obvious sweet tooth, so yes, some of the appeal is that I get to basically order sweets for my main course. Yes, I'm the one who always goes for decadent brioche stuffed french toast or pancakes sporting more toppings than an ice cream sundae, and calls it "brunch", not "dessert". Since I love baked goods, any time I can eat muffins, scones, or danishes, I'm a happy camper. Our original plans for Sunday were to either go to the famous Bourke Street Bakery, where I could get some of my favorite baked goods in Sydney, and hadn't yet visited on this trip. Or to Four Ate Five, where Ojan fondly remembered an epic meatball sandwich, and I was of course eying the french toast stuffed with bananas, mascarpone, and rhubarb. But Pinbone drew me in with something even better: breakfast rice pudding! I love pudding, and rice pudding in general, and the idea of one that was acceptable for breakfast was just too much for me to resist. The experience at Pinbone for brunch was everything I wanted it to be. The service was just as good as the night before, although a bit more laid back and casual, which matches the brunch feel. The food was amazing, as you'll read about momentarily. As I said, one of the best brunches of my life. And the prices? Totally reasonable, and far better than those at the other brunch heavy hitters we visited like Bill's and Devon Cafe, where the food wasn't nearly as good. Plus, there was no wait (although, I hear there is earlier in the morning). 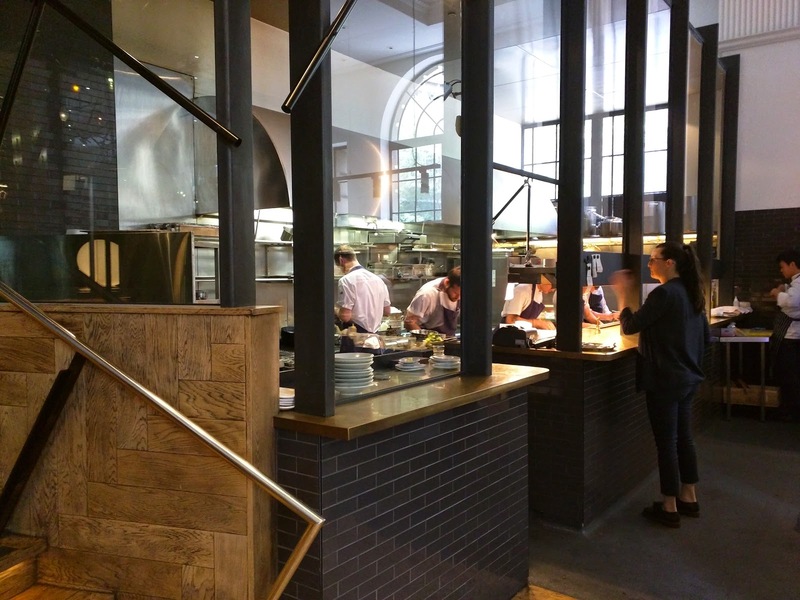 Pinbone was the trifecta of perfection for brunch: great food, reasonable prices, and no wait? Unheard of! 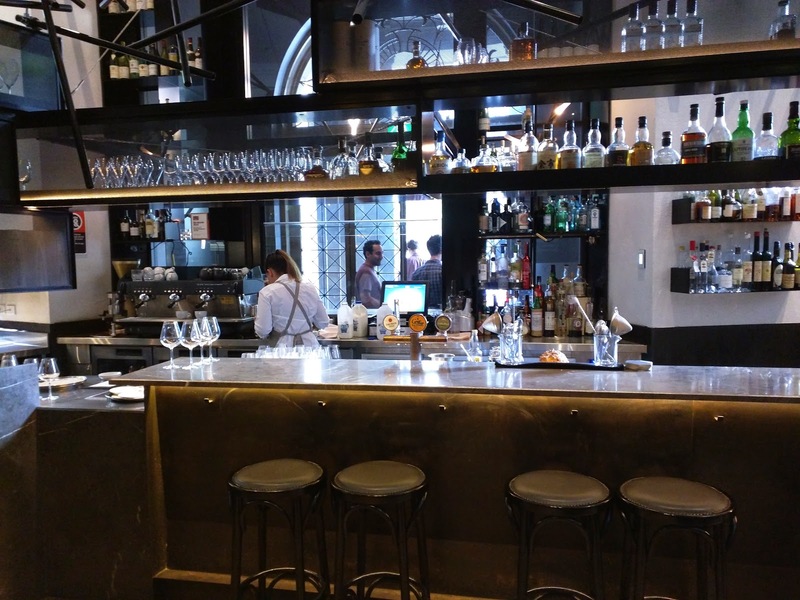 Yes, I'm telling you that a fascinating menu, fantastic food, no waiting on the sidewalk, pleasant service, and reasonable prices actually exist, for brunch, in Sydney. You just need to go to Pinbone, and you should do so now. 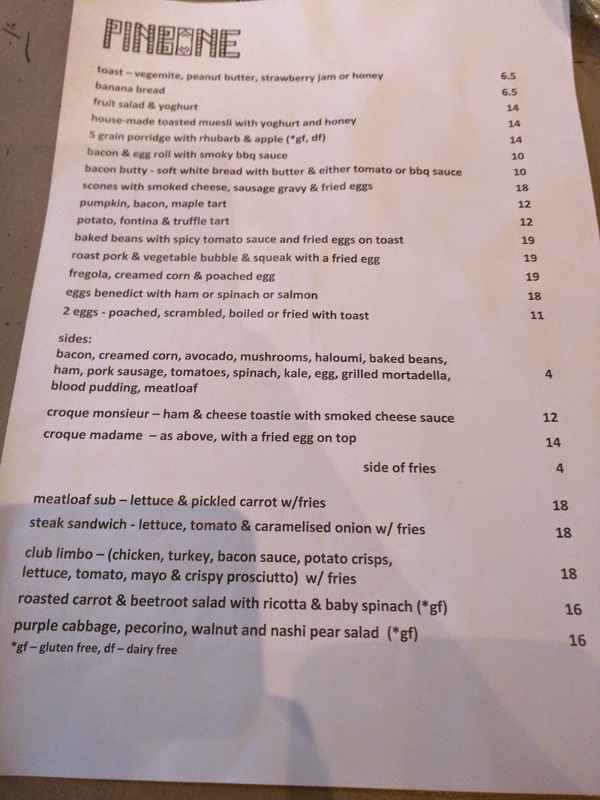 There are a slew of reasons I'd love to move to Sydney, but honestly, the mere existence of Pinbone is yet another. It made me think more about the question of where in Sydney I'd live if I moved there. 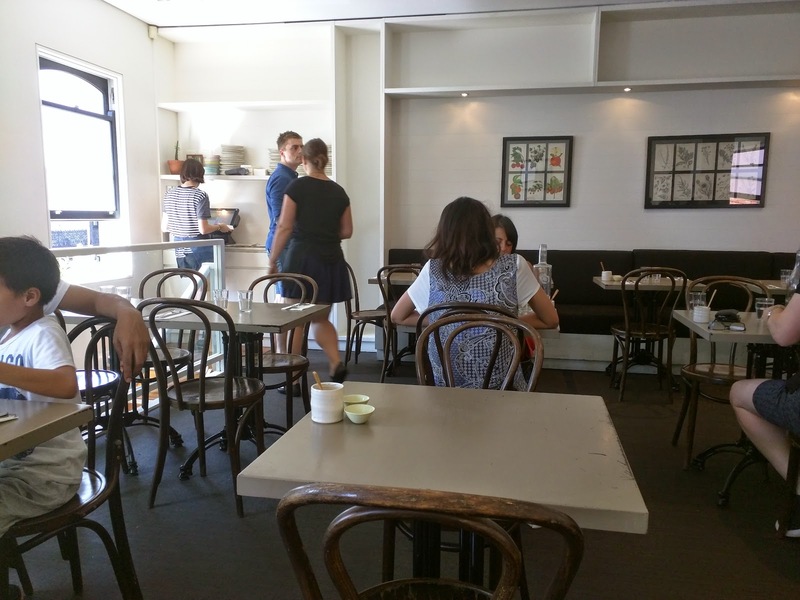 I decided that I'd certainly consider going in the direction of Woollahra; it was so good, that I want it to be my local cafe. For Sunday brunch, they place a little wooden "Cafe Open" sign on the sidewalk. Somehow, that one simple sign sets the tone for what is to follow: a rustic, casual touch, but one that shows fine attention to detail and feels so welcoming and inviting. The two windows you can see in the photo are the restaurant, as I mentioned in my review of dinner, we were seated downstairs for dinner (bottom window), but the majority of the restaurant is upstairs (top window). The previous night we were seated at one of the only three tables downstairs, but for brunch we were seated upstairs in the larger room, so I got a chance to check it out. It is filled with the same style of tables and wooden chairs, just many more of them. The Pinbone brunch menu has all the classics you'd expect in Sydney, like toast (with vegemite of course), fruit and yoghurt, house-made muesli, 5 grain porridge, bacon butty or bacon and egg rolls, bubble and squeak, croque monieur (or madame), eggs benedict (with ham, or spinach, or salmon), and simple toast and eggs (cooked however you want). But they are known for some more creative options, including a tart with creamy pumpkin spread and crispy bacon, scones with smoked cheese, sausage gravy, and fried eggs, and a savory fregola and creamed corn dish. If I didn't have my eyes already firmly set on the breakfast rice pudding, the scones with gravy sounded amazing, as I love biscuits and gravy for brunch, and this sounded even better. The list of sides is extensive, ranging from your choice of meats (bacon, ham, sausage, mortadella, blood booding, or meatloaf), vegetables (creamed corn, avocado, mushrooms, tomatoes, spinach, kale), to other goodies (haloumi, baked beans). I also really wanted to try the grilled mortadella! Too many amazing things. They also offer lunchtime items including a few sandwiches, salads, and fries. The goodness doesn't stop there however, as there were two additional menus, containing all the specials. 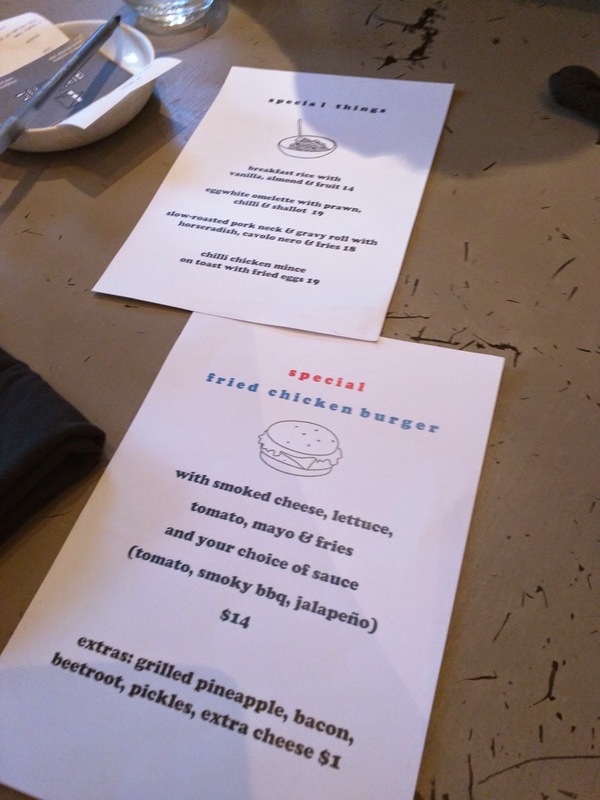 One featured a single item: the fried chicken sandwich, another dish they are famous for. While listed as a special, it seems to be a staple. The other specials menu featured my precious breakfast rice pudding, and a few other items. I wanted more than half the menu. Because it was just Ojan and I, we had to limit our choices, and since we had seen the menu the night before, including the specials, we arrived knowing what we wanted to order. We were prepared ... or so I thought. Baked Goods on the Counter. And then we walked in. At the front counter near the entrance was a selection of baked goods, including incredible looking apricot & white chocolate muffins, fig & ricotta muffins, and stuffed donuts with chocolate & hazelnut, baked cheesecake & blueberry, or malted custard & rhubarb. OMG. Remember that weakness for baked goods I was mentioning? And, they also have a dessert menu, even at brunch, and it includes ... banoffee pie. I was doomed. 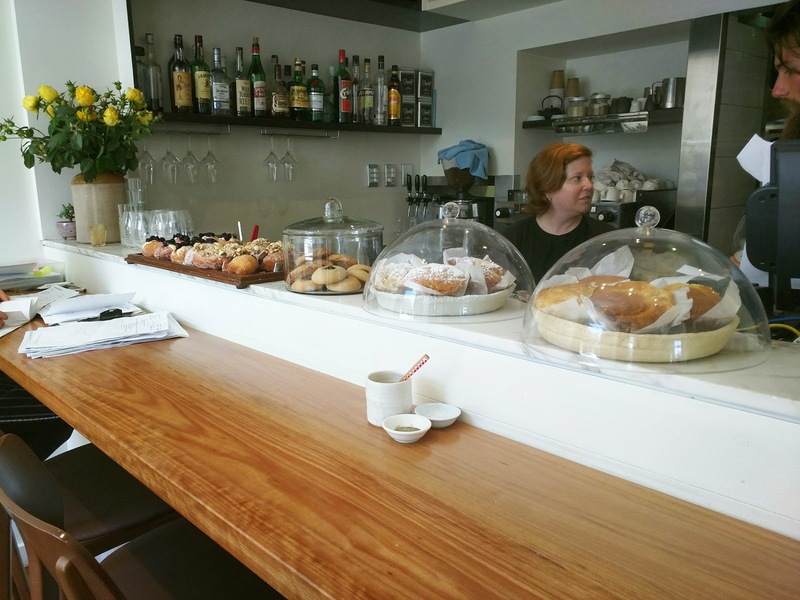 The setup with the baked goods and coffee downstairs at the counter made me imagine that you could easily swing in just to get a takeaway coffee and muffin and/or donut, which I assure you, if I lived nearby, I would most certainly do. 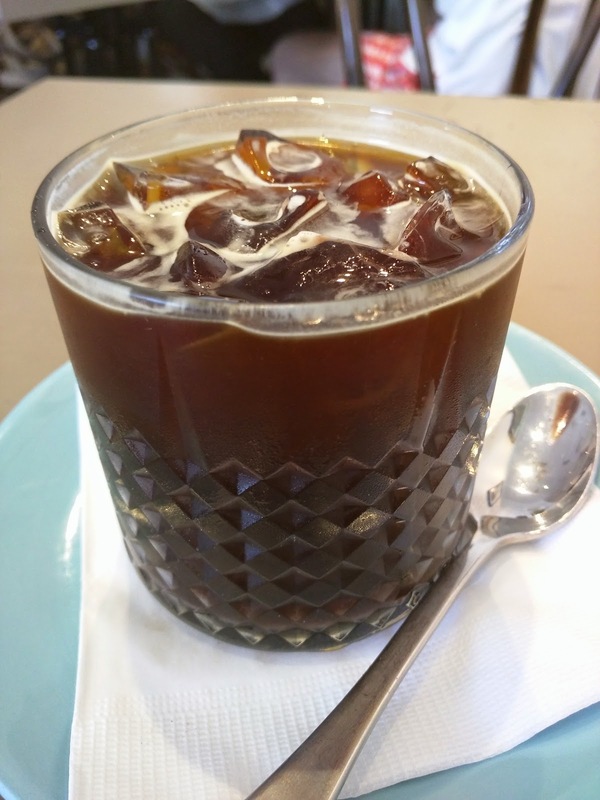 Decaf Iced Long Black. $4. Before I dove into food, I ordered coffee to settle in. Pinbone uses The Little Marionette roasters, which I was unfamiliar with. The previous night I had a hot coffee, but given the very, very hot Sydney day, I opted for iced this time. I still wanted coffee with my brunch, but couldn't imagine drinking a warm beverage. If you've been reading my Sydney posts, you'll recall that I tried to get a basic decaf iced coffee many times. In the US, I'd order an iced decaf Americano (or really, an iced coffee). I assumed that an iced decaf long black would be just as easy to do, but, let's just say, that the results were rather amusing. Most commonly, like at Devon Cafe, I wound up with just a glass of lukewarm coffee with a token ice cube floating in it. I regularly needed to order a separate glass of ice just to salvage it, like at Trio. But Pinbone proved to be a winner in this department too, bringing me exactly what I wanted. The long black was actually cold, and there was plentiful ice in it. Perfectly refreshing for the hot day. Finally! The $3.50 + $0.50 decaf charge was on par with most places around town, which I still think is high for a drink sans any dairy. Fregola, Creamed Corn, Poached Egg. $18. 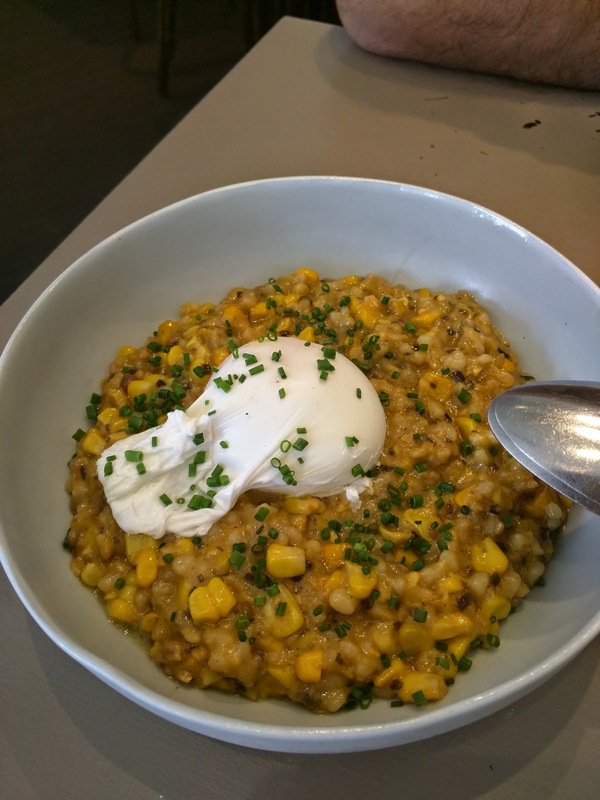 As I mentioned, Pinbone has a number of signature dishes, and the fregola, creamed corn, and poached egg is one of them. If we had visited with a larger group, it certainly would have been a dish we selected. Of the purely savory dishes on the menu, it probably would have been my first pick, although I was also very interested to see their take on muesli, as I was rather obsessed with muesli in Australia. Oh, and the aforementioned scones with smoked cheese, sausage gravy, and fried eggs. Or any of the sides like haloumi, grilled mortadella, and some epic looking hash browns. Seriously, I wanted it all. But I had my eyes solidly on my first pick, so I passed up the fregola and creamed corn. Yet you see a photo of it above. I went to the bathroom to wash my hands after we placed our order, only to find that the fregola dish awaiting my return! Ojan smiled, and said that it was sent out complimentary for us, as they recognized us from the night before. Woah, regulars already? I loved it! I did groan a bit inside since we had already ordered two full dishes, and were hoping to save room for pie or a donut, and, we'd also already had a really big breakfast earlier at our hotel, since we were having a later brunch, and I adored our hotel breakfast spread. I again wished that we had managed to convince more people to join us. Still, I wanted to try it, and I figured I could take a few bites, and then somehow use willpower to wait for my real order, and not fill up too much on the fregola. Ha. I took one bite. And another. And another. And another. Suddenly, I cared much less about my upcoming breakfast rice that I had been so looking forward to. I was glad there was no one else there to share this with. Wow, it was good. The flavors were incredibly complex. I don't know what was in the seasoning, but the depth of flavor was unreal. This was the sort of dish that makes your eyes roll back in your head. I read later that it is cooked in a stock made from kelp, roasted corn cobs, and husks of corn. It wasn't child's play. The fregola was a bit crunchy, in a way that made it a pleasure to eat, particularly when paired with the softer, sweet corn kernels. Ojan thought there was a lot of cream in it, but I really didn't think it was that rich. Maybe I was just tricking myself. The egg on top was perfectly poached. It was a thing of beauty as Ojan cut into it and the yolk ran out, mixing into the dish, adding some richness. Neither of us could stop eating it. It didn't matter that we had more food coming. We literally couldn't stop. Just like at dinner the night before, I was blown away by the intense flavors and textures. I loved how hearty and comforting it was. It was also quite filling. Whoops. But wow, I'm so pleased that we were able to devour this, and I'd certainly get it again. The menu lists creamed corn as a side option, I wonder if it has the fregola in it? If so, splitting a side, sans egg, seems certainly recommended. One of the best savory brunch dishes I've had in my entire life. 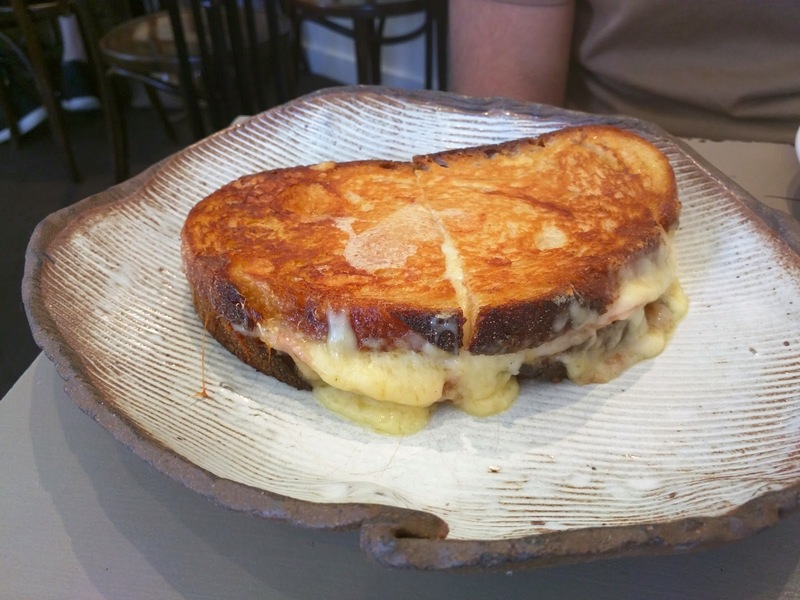 Ojan's pick was the croque monsieur, made with Barossa ham and smoked cheese sauce, on Luxe Bakery bread. It was a very decadent item. The bread was well toasted and crispy, clearly coated with butter to achieve that effect. Inside was creamy, smoky béchamel AND a ton of melted cheese. I took the first bite, and the stringy cheese seemed like it was never going to end. I loved the creamy béchamel, and would have gladly eaten more of it, but, after the bonus starter and with my meal still in front of me, I stopped after a few bites. Ojan really liked it, but he only made it through half the sandwich himself. After the filling fregola dish, it was just too much. Plus, he said it was actually just a bit too decadent with all the cheese. He said a half was just right though, and that this would be a good share dish in the future. Or, perhaps just served as a half sando with a side salad? Breakfast Rice with Vanilla, Almond & Fruit. $14. And finally, my main dish: breakfast rice! This was the reason we were at Pinbone. I saw it listed as a special when I looked at the brunch menu the night before, and I knew we had to return solely for this dish. Sure, I was optimistic that Pinbone would do a good brunch in general just based on the dinner performance, but, this dish is exactly the sort of thing that I love. Pudding. Yes! We really don't have brunch dishes like this in the US, but in Sydney I found the tapioca brunch pudding at Devon Cafe just the week before (although that was totally different, a cold dish). Perhaps pudding-breakfasts are a thing in Australia though? The amusing thing is that I actually don't like rice, at least in savory preparations. When I eat Indian food, I always skip the rice and just use naan to soak up my curries. When dining on any other rice-centric cuisine, like Chinese, Thai, or Persian, I just skip it completely. I am obviously not carb-adverse, I just never like rice. Of course, that all changes when it comes to desserts. On this trip alone, I ate a slew of rice based desserts, including the mango and sticky rice at Home Thai and a bunch of different items that included rice at Chat Thai. Even the night before at Pinbone, we had the black sticky rice and banana dessert, partially because I wanted sticky rice. So I love rice in my desserts, and in particular, I love rice pudding, any style (although I've become partial to Turkish style baked rice puddings lately). Anyway, I digress. I wasn't entirely sure what "breakfast rice" was, but I had a hunch that it would be like a rice pudding. 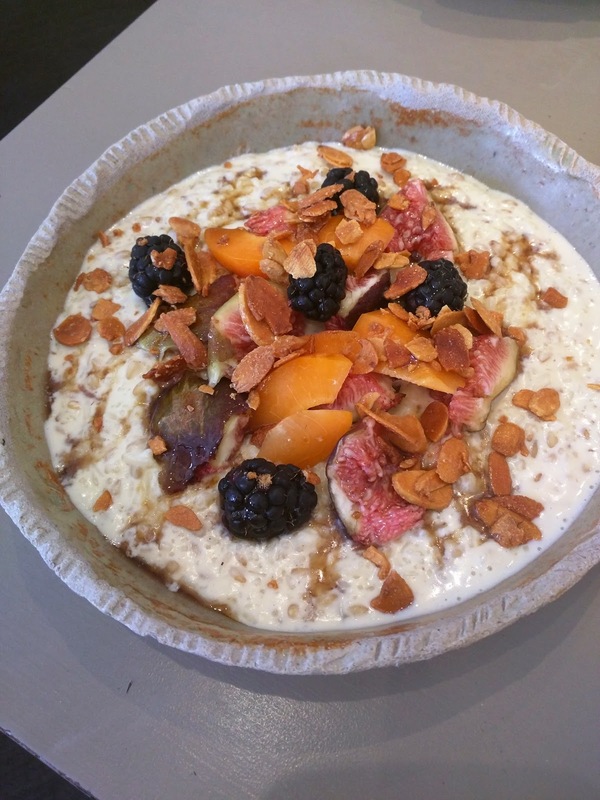 A cross between a porridge and a dessert, hopefully? Exactly the sort of thing that I really like. And ... it was! There were several assorted types of rice, including a short grained white rice and a crunchier heartier grain, in a cream base. It was obviously sweetened, but it wasn't too sweet, and didn't push too close to the dessert boundary (not that I would have minded, since I'd had the savory fregola already at this point, I was ready for dessert!) The whole thing was drizzled with a vanilla syrup, which really infused a subtle vanilla flavor in nearly every bite. On top was fresh fruit: figs, blackberries, and apricots. Please recall how I feel about blackberries ... I hate them! I tried one, just to see if somehow Australian blackberries weren't full of horrible seeds, but alas, they are, and I didn't like these, but obviously, that was just personal preference. The figs were fine, but we have really great figs in California. I have a lot of fruit envy when I'm in Sydney (particularly for their mango! ), but figs are one fruit where California really does spoil me. The apricots were delicious. My favorite component was the candied sliced almonds on top. Since the rice pudding itself wasn't too sweet, the candied nuts added pops of sweetness, but also, an incredible crunch. I'm a textures person, and this dish had it all going on. The rice had just the right amount of chew, the base was creamy, the fruit was soft, and the almonds were crunchy. It was so easy to form perfect bites encompassing every texture and flavor I was after. I liked the dish, but after the corn and fregola, it was a bit of a letdown initially. This wasn't a bad thing really, and I decided it was good that I didn't love it, since I'd be able to leave some untouched and not stuff myself even more than I already was. I put my spoon down with quite a bit left and thought I was done. I declared out loud to Ojan I was done. But ... I went back for just one more bite. Interesting, it grew on me as it cooled down. The texture changed, as it became thicker, and I liked it more that way. I got completely immersed in crafting perfect bites, incorporating the almonds. It was just so comforting and creamy ... but still, I vowed to stop. I was already full! And then, somehow, with Ojan's help with the blackberries and figs, I finished the entire thing. Literally, the entire bowl full. It hurt, I won't lie. I went into such a state of food coma that I didn't want to move. Getting up out of my chair and going on our planned walk around Centennial Park across the street took sheer will. But, wow it was worth it. Sometimes, you just need to stuff yourself, enjoy every moment of it, and deal with the consequences. In the end, I loved the dish. 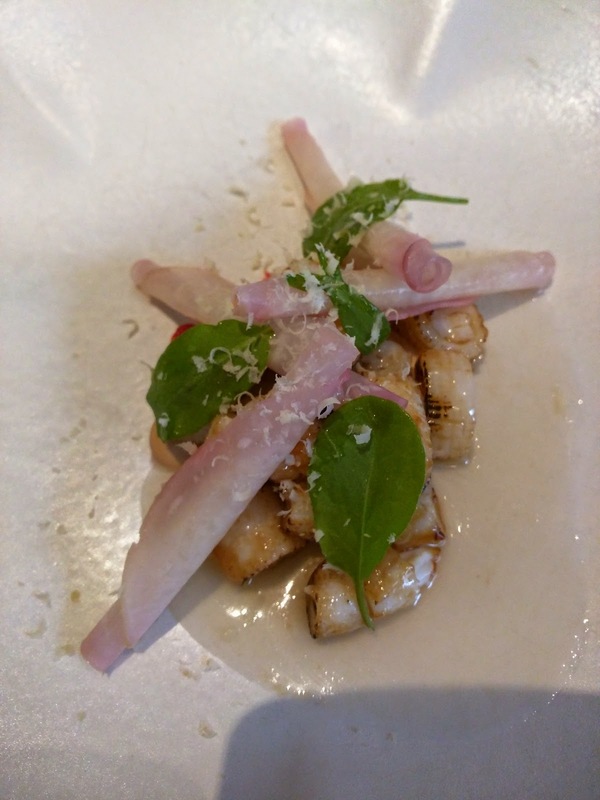 Like most of Pinbone's creations, it was all about the balance of textures and flavors. I always want sweet items at brunch, but feel I need to be "responsible" and order something that isn't just sweets, but this dish managed to satisfy my sweet tooth perfectly, without making me feel like I was eating dessert for brunch. It was a hearty, satisfying dish in every way. It was everything that I had wanted the Devon Cafe tapioca dish to be . I'd get it again, in a heartbeat. And I'd finish it all again too! But I would eat a smaller breakfast beforehand. On my first visit to Sydney, I went to all the top restaurants: Quay, Tetsuya, Sepia, Marque, Bécasse. Some were better than others, but none were the calibre of places I regularly dine at in San Francisco, and all were far pricier. On our next visit, we tried a few more places that were supposed to be amazing. Again we were disappointed. We quickly learned that Sydney is just not the place to go fine dining, particularly when you are accustomed to Bay Area standards. That isn't to say that all is doomed when it comes to dining in Sydney. On this trip, we focused on what Sydney does well: cafes for brunch. Thai restaurants. Bars with decent food. Asian desserts. Gelato. We mostly avoided any menus that sounded like what we'd get at home. Yet, during my research, I kept seeing rave reviews for a place called Pinbone, all the way in Woollahra, a bit far from where I was staying and working. I didn't really see a reason to venture all the way there, particularly for that style of food, given past experience. But so many people loved it. It also didn't seem necessarily as formal as the fancier places we had ventured to. Maybe there was hope? 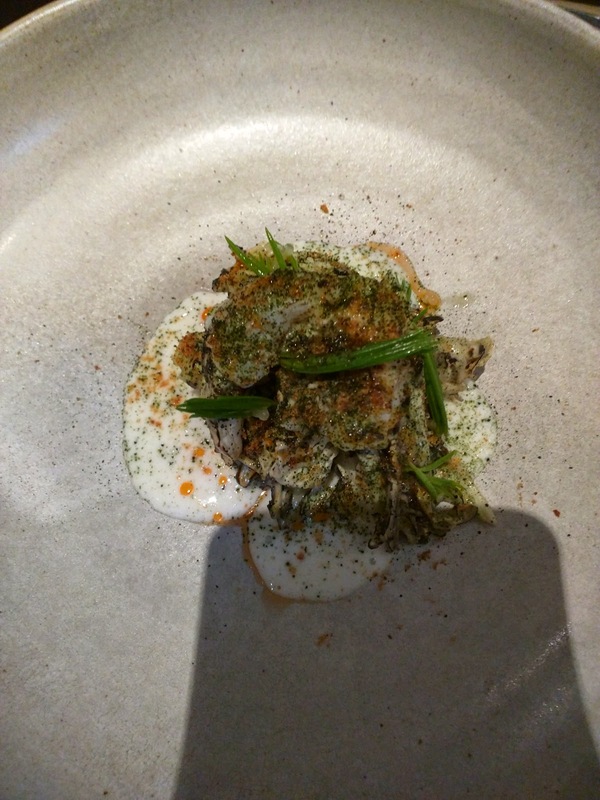 Thus, on our second-to-last night in Sydney, Ojan, myself, and one co-worker other finally went to Pinbone. The others traveling with us deemed it too far and choose to stick nearby the hotels. Spoiler: they all missed out. Big time. This was the best meal of the trip, no question. I'm pretty sure it was the best meal I had in Sydney, ever. I wished we had visited Pinbone sooner, as I certainly would have returned at least one more time for dinner. (I did in fact return, the very next night, for brunch, since they weren't open for dinner on Sunday. The delivered the best brunch of the trip as well!) If I were a local, Pinbone would be my goto place, no question. Suitable for a fancy night out, or even a casual dinner, although, I don't think you can just walk in most nights, as bookings seem necessary. Dinner is served in two seatings, 6pm or 8:30pm, and we opted for the 6pm, which might be slightly early for some, but is actually the schedule we are normally on in San Francisco, so it suited us fine. So, what makes Pinbone so good? Simple: they just get everything right. They nail every aspect of the dining experience. Most importantly, it feels comfortable. No, this is not Michelin star dining, but quite honestly, the food is at that calibre, except done in a setting that puts you perfectly at ease. The staff were attentive, but not too formal. We were never left wanting anything. The ambiance was warm and inviting. It felt like a rustic cafe, yet, as we'd discover, the food was not anything like you'd get in a simple cafe. The kitchen clearly knows what they are doing. The ingredients used are high quality, the food is well prepared, and the dishes expertly crafted. The flavors and textures are just completely dialed in, highly refined. They take some risks with interesting combinations and techniques, and they pay off, honing in on a magical combination of smoky, salty, and umami flavors. The plating is elaborate, and resembles the artistic plating you see at far fancier venues. Speaking of artwork, the dishware is all custom pottery, made by local artisans. Nearly every dish is served on a different style of plate, and all are rustic in appearance. The staff also just really seemed to care, again, a bit different than we were used to in Sydney. Service in Sydney generally seems to be lacking, which we always attributed to the lack of tipping culture. But here, they cared. I asked for a white wine suggestion, and was given a small pour of the suggested wine. When I didn't like it, the server came back with a large selection of wines, happy to pour me a taste of each so I could find the one I liked. It wasn't that the staff weren't busy. Never once did I see anyone just standing around, they were in constant motion, running up and down the stairs, balancing an impressive number of dishes at a time. They left (complimentary!) sparkling water in jugs on the table, and both our glasses and the jugs themselves, were constantly refilled. Our needs were taken care of, before we even realized it. Speaking of drinks, Ojan asked for a mocktail. His ask was that it be not too sweet, and somewhat tart. This is what he asked for most placee, and most of the time, he still wound up with a glass of sweet fruit juice. But not at Pinbone! They produced probably the best mocktail he had on the whole trip, made with fresh lemon, lime, and orange juice for tartness, muddled with cucumber for freshness. Tart and refreshing, and, gasp, not too sweet. Really unique and he quite enjoyed it. We were seated downstairs, a small area with only 3 tables and a few bar stools. The bar, and the larger table, were not occupied, so there was only one other table of 3 seated in this area, resulting in a really intimate setting. I'm glad we were seated down there! Doesn't it even look like someone's home? So cozy. The kitchen is also on this floor, so we got to see each and every dish as it came out of the kitchen. Everything was droolworthy. As I watched dishes go by, I made a mental note of all the ones I wanted for my next visit ... if only I were staying in town longer! Stairway to Main Dining Room. Everyone else was seated upstairs. The waitstaff were impressive in their running up and down the stairs, hands full, all night long. I'd love to throw a Fitbit on them for a night to see how many sets of stairs they climbed. 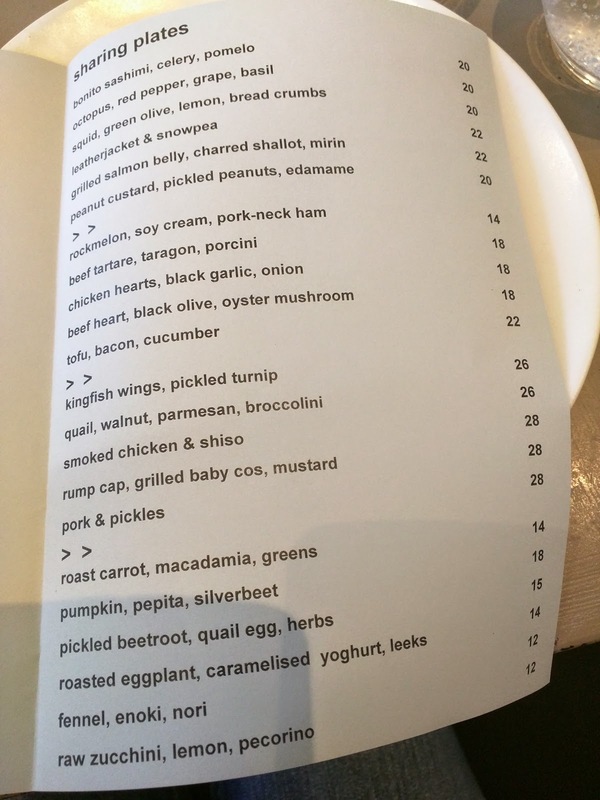 Another unique aspect of Pinbone is the menu. It is a place you are supposed to come with friends, share a bunch of dishes, relax, and enjoy yourself. 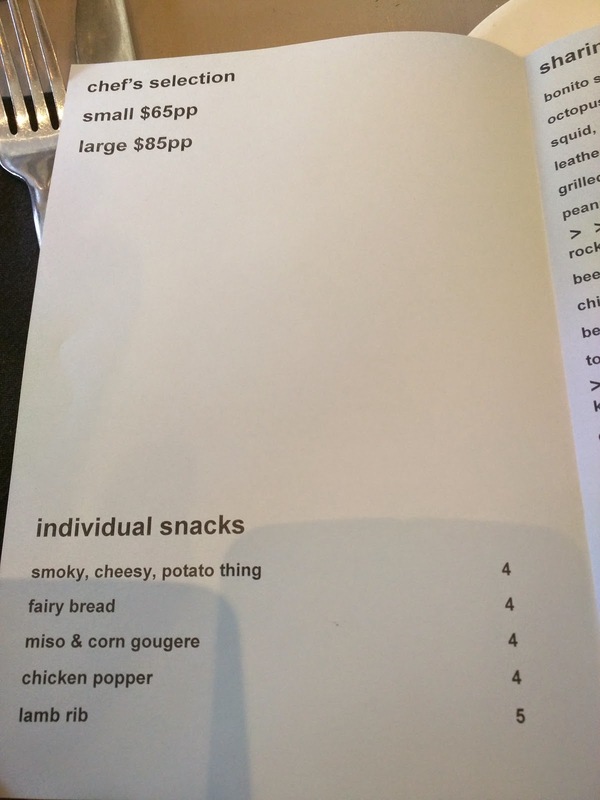 The menu opens with "snacks", pieces priced and served individually, so everyone can pick whichever items they want. I love this format, as we weren't stuck ordering an awkward number of anything; no need to cut items in half, or double up on something when we just wanted one. I really wish more places used this model. The "snacks" are all quite playful dishes, which set a fun tone for the meal. For example, one, which we didn't order, is their spin on fairy bread (an Australian snack served at kid's parties, normally consisting of a slice of white bread, spread with butter, and topped with sprinkles), except that they replace the butter with mascarpone and the hundreds and thousands with salmon roe. It was on my list for sure, but it didn't make the cut on this first visit. Next time. They also offer what has to be the best valued tasting menu I've ever seen, either $65/pp for a "small" selection or $85/pp for "large". Another time, I'd love to do the tasting menu, and just leave it to the chefs to feed me all the highlights. Lamb Rib ($5). Cheesy, Smoky, Potato Thing ($4/each). Corn & Miso Gougere ($4/each). We started with several of the snacks. The snacks all arrived very soon after placing our order, indicative of the service we'd receive all night. The kitchen operated at high efficiency, cranking out dishes rapidly, but we never felt rushed. First, a lamb rib. Ojan was the only one who wanted a lamb rib, but that was fine, we could order just one! It was glazed and coated with crunchy nuts. I read online afterwards that it was inspired by a Golden Gaytime, a popular ice cream treat, with the bone mimicking the popsicle stick and the crunchy nuts the biscuit coating, but we didn't pick up on that at the time. Ojan enjoyed it, but said his favorite lamb from the trip was from Watsons Bay Beach Club. Next, the snack I read many reviews for: a "cheesy, smoky, potato thing". The name of this alone lets you know that the restaurant wants you to have fun here, and just enjoy it for what it is. And this, well yes, it is a cheesy, smoky, potato thing, a crispy potato skin with a puddle of melted cheese inside. I opted not to have one since for some reason we overdid it on fries, chips, wedges, or other forms of fried potato literally every day on this trip, and I was quite frankly very sick of potatoes. Of course, I did still one tiny bite of Ojan's. It was fine, and I appreciated how crispy it was, but I was sick of potatoes. The guys really liked it though, and kept raving into the night. The snack I did try was the corn and miso gougere. How fascinating sounding is this? It was basically pâte à choux, like you get in a cream puff, stuffed with creamy corn pudding. No individual corn kernels were present. The choux pastry was light and airy, the filling warm, creamy, and comforting. For some reason, I was expecting it to be cheesy, and it wasn't. I think because most gougeres I've had in my life have been cheesy, but this isn't a bad thing, just, unexpected. The winning element for me was the miso glaze on top. I love miso, and the salty flavor really pushed it over the top. I also loved that it looked even more like a cream puff this way, with the glazed top. This was a really unique bite, but I'm not sure I'd really want another. My 4th pick of the savories. Prices were all good for individual pieces. The rest of the menu is the shared plates, broken into categories roughly based on their size and heaviness. Since I always want bites of everything, this menu format really appeals to me, I wasn't forced to select just one main dish. There were a number of smaller, lighter dishes I wanted to try, including grilled octopus, butter poached squid, and grilled salmon belly that looked phenomenal every time I saw it go by. But, there were only three of us, and we weren't particularly hungry since we had a huge late brunch earlier that afternoon, so, we had to cull our choices. Oh, and one of the diners was vegetarian. So, we settled on just a few sharing plates, mostly vegetarian, and I drooled over the others as I saw them enter the room. 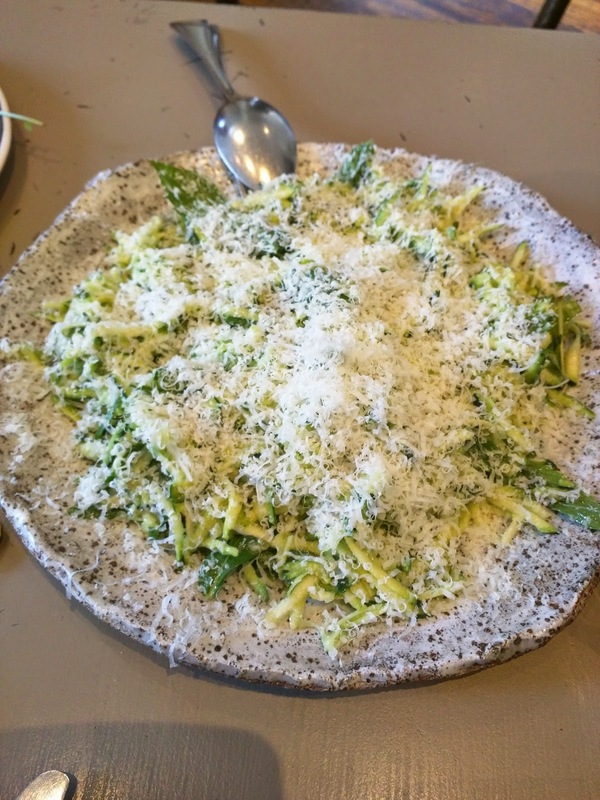 Raw Zucchini, Lemon, Pecorino. $12. For vegetarian dishes, most of the options were the smaller side dishes, so we selected several of them. Our vegetarian friend really wanted the raw zucchini salad, so even though I had no interest in it, I wanted to let the vegetarian have something exciting that he wanted, so we got it. The zucchini was raw, shaved thin, and mixed with basil and lemon, topped with pecorino cheese. Lots of pecorino cheese. I thought the zucchini was a bit mushy, and this was really not my thing at all, but I did like the saltiness from the cheese on top. Mine, and everyone else's least favorite savory dish. That said, our vegetarian friend did like it, but after having the other dishes, he said this was just the least interesting, not that it was bad, just, not nearly as exciting as the others. Roast Carrot, Macadamia, Greens. $14. The online menu listed a dish of slow roasted carrots with mussels. I was eying it from before we arrived at the restaurant, as I read so many amazing reviews of it. But alas, the dish was no longer on the menu. 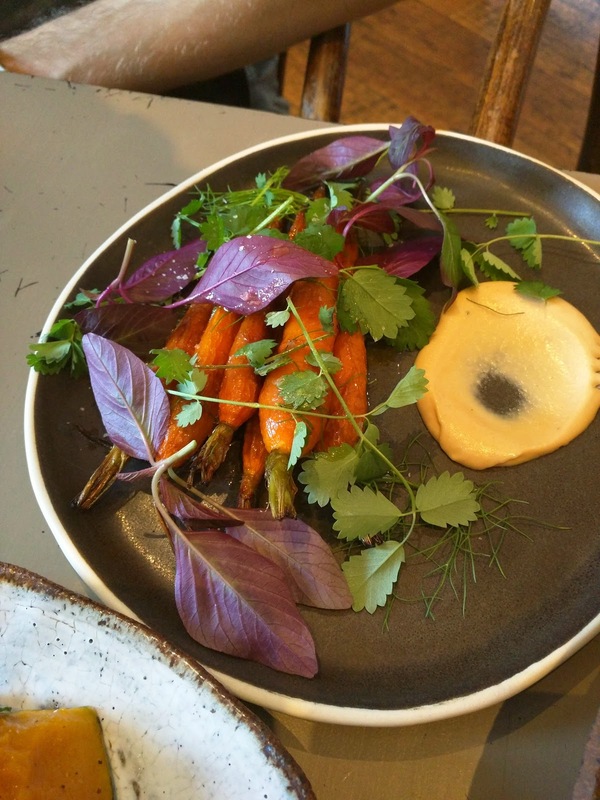 I was disheartened, until I saw this vegetarian roast carrot dish on the menu. Not exactly what I wanted, but since the carrots were the part people raved about from the other dish, I'd still get to have those, and our vegetarian friend could join in. Of course, not that I knew exactly what to expect from a dish simply called "roast carrot, macadamia, and greens". For starters, I probably expected to see some macadamia nuts. The carrots were indeed pretty amazing, slow roasted, and caramelized. The garnish was an incredible assortment of fresh greens, I don't even know what they all were. They were all super fresh, beautiful, and quite flavorful. This was a testament to the amazing things one really can do with fresh produce! Vegetarian food does not need to be boring. My favorite part of the dish was the macadamia. It was there, as a puree, rather than whole crunchy nuts. It was a bit smoky, a bit nutty, really quite flavorful and fascinating. I appreciated the creamy texture along with the crisp greens. 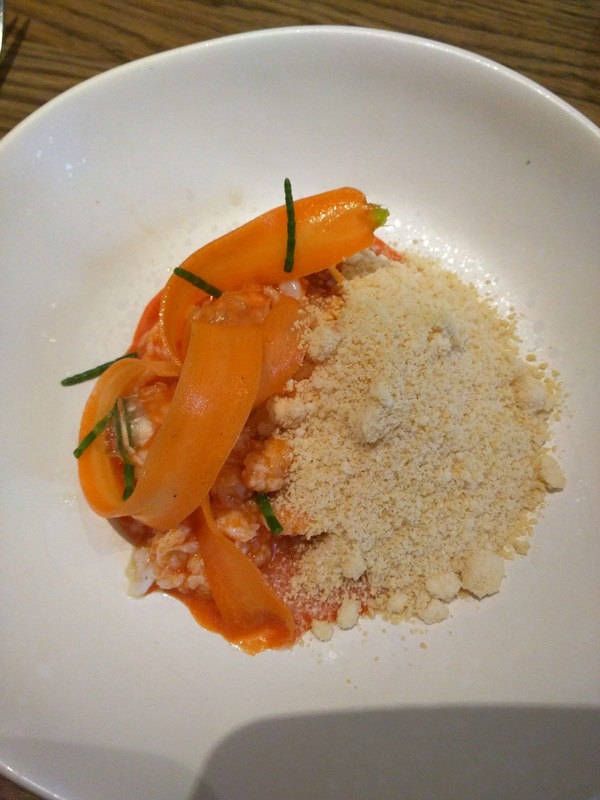 This dish captured a lot of what I loved at Pinbone: it was fairly simple ingredients, just carrots, macadamia, and greens, right? But the presentation was beautiful, and the freshness and lightness were very welcome after several weeks of eating all our meals at restaurants. My second favorite of the savories, and Ojan's favorite. The final vegetarian dish we picked was another I had read many positive reviews of. Even omnivores said this was the surprise hit of the night for them, so clearly, we had to get it. The pumpkin (acorn squash?) was nicely roasted, soft, skin on, which I appreciated. The silverbeet (chard to us Americans), was fresh, crispy, and pleasantly bitter. The pepitas added the perfect crunch. Underneath it all was a puree, I believe also made from pepitas. Soft, creamy, crunchy, fresh. All in one. One diner said the dish reminded him of Thanksgiving. Overall, it was good, and like the previous dishI really found the texture combinations to be interesting, but it was my 3rd pick of the evening. Kingfish Wings, Pickled Turnip. $26. For a non-vegetarian dish, we opted for a more substantial item, kingfish wings. This was my pick, as it sounded like the most unique of the seafood offerings. We don't have kingfish in the US, and I haven't eaten many fish wings in general. The serving was quite large, 3 wings. The kingfish seemed to have been grilled, as it had a crispy, charred exterior. I couldn't get over the amazing smoky flavor this technique imparted on the fish. I even wanted to eat the fins, just to get more of the intense charred flavor. While the outside had a great crispy exterior, the inside remained moist and tender. It reminded Ojan and I of hamachi kama from a Japanese restaurant. Why don't we eat more fish wings and cheeks anyway? It is where the most tender moist flesh is. I also really enjoyed the physical act of eating it, sucking the fish off the bones, which I did to maximize my exposure to the smoky flavor. This is actually generally the opposite of my regular behavior, as I don't tend to like my meat on the bone. Speaking of flavor, the fish was coated in some kind of glaze, I'm not entirely sure what it was, but it was sweet and salty and totally delicious. I may or may not have tipped the plate up on its side at the end and just spooned the remaining sauce into my mouth. Soooo good. On the side was pickled turnip, which I didn't actually care for, it was too tart and vinegary for me. I think this was a new accompaniment though, because the online menu listed pommelo instead of turnip, and when I asked our server about the preparation she told me it came with pommelo, and when she brought us the dish, she again said it was pommelo, and there was no mention of the turnips either time. And there was no pommelo on the plate, which I think that would have worked better, bringing some tartness, but not quite so much acidity as the vinegary pickle. Anyway, I loved this dish, turnips aside. The crispiness, the smokiness, the saltiness, the sweetness ... it all just combined perfectly. My favorite savory dish, hands down. It made me wish I were hungry enough to add the grilled octopus dish to our order too. Pinebone's chefs clearly know how to grill things. This was certainly large enough to be a regular seafood main dish at a traditional restaurant, so the $26 price was incredibly reasonable, lower than most anywhere else we visited. We were all quite full, and could have easily skipped dessert. It is basically unheard of for dessert loving me to even consider a meal complete without dessert. But I really was happy and satisfied with the savory food alone. I know, I rarely say this. I'd say it happens perhaps twice a year? And this was one of those times. But curiosity got the better of me. If the kitchen produced savory food that good, I really wondered what their desserts would be like. And, quite honestly, besides the gelato from Messina, desserts in Sydney paled in comparison to what I'm used to, so my sweet tooth was feeling a bit deprived. Like with the savories, the menu didn't quite reveal what the dishes would be, with options such as "meringue, vanilla cream, fruit". That sounded like one of my leave favorite Australian desserts, pavlova? Or, "blueberry granita, pinenut brittle, & white pepper parfait". White pepper? Hmm. But I was drawn in by the "banana and black sticky rice sundae", because I was on a sticky rice kick in Sydney from eating at so many Thai restaurants. Once I started thinking about a black sticky rice sundae, I had no choice but to order it. The others were also very full, and didn't want dessert. But then a special involving blackberries was announced, and our vegetarian friend decided he needed that too. To pave the way for desserts, I ordered a decaf long black. I hoped that taking a few minutes to sip some coffee would somehow allow me to digest a little. 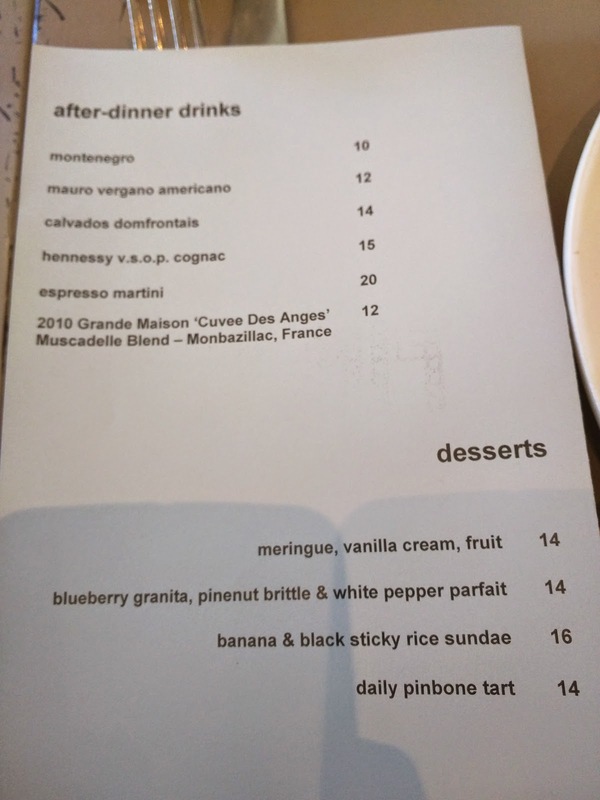 Plus, I always love having a bitter coffee to pair with sweet desserts, although I had a hunch that Pinebone's desserts would be balanced enough on their own. 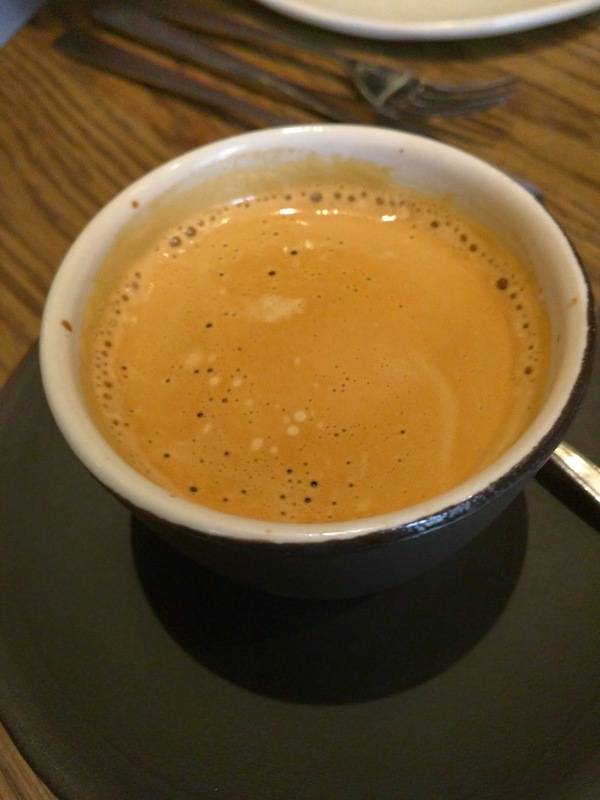 Pinbone uses The Little Marionette roasters for their coffee, which I was unfamiliar with. I'm assuming they are local, but I didn't find their beans anywhere else in town. The coffee was strong and pleasant enough, and I didn't need to add any sweeteners nor milk to make the decaf palatable. Like many places, they charge an additional $0.50 for decaf, and the price matched most cafes I visited. Special Dessert: Hazelnut Parfait, Chocolate Sauce, Blackberries. So, as I said, we were all pretty full. Ojan claimed that he'd have a single bite of a dessert, no more. I had the one dessert I was eyeing, and it certainly wasn't this one, as I don't eat chocolate at night, I don't really like hazelnuts, and I loathe blackberries. But ... our other diner had his heart set on this, so, two desserts it was. For basically only two people, both of whom were pretty full. 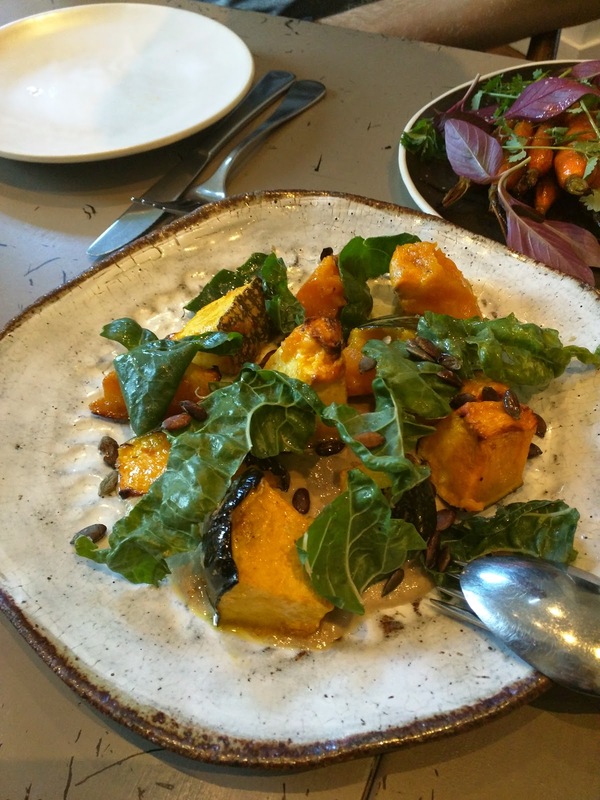 It turns out, that even if you are full, Pinbone will inspire you to find a way to eat more. While he didn't eat his full share, even Ojan certainly managed more than a few bites. 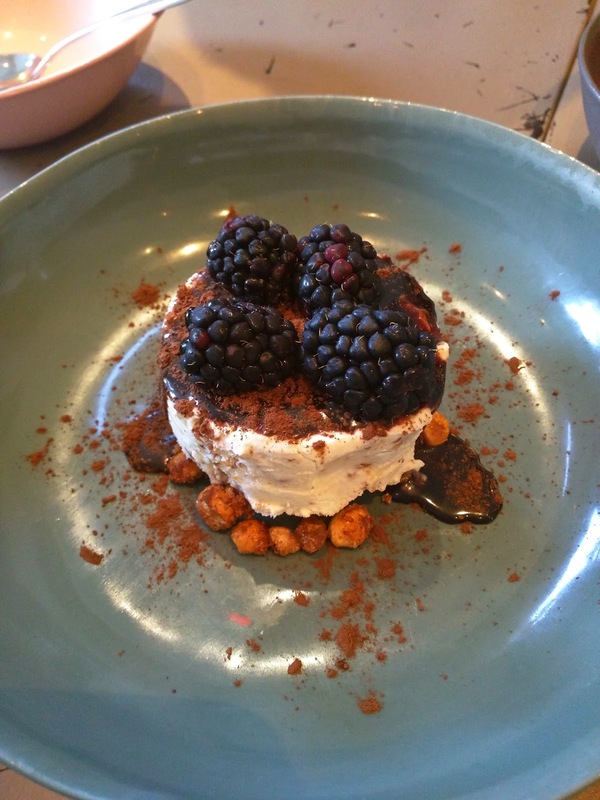 Anyway, this was a creamy parfait, studded with little chunks of hazelnut for crunch, with chocolate sauce poured over it, adorned with whole candied hazelnuts, finished with blackberries on top. I tried a few bites, because I couldn't resist, even though no component was one I thought I'd like. While it wasn't my thing, I was fascinated by the creamy texture and the crunch of the parfait, and I'm sure if you are a Nutella lover, this would have been awesome. None of us were quite sure what the parfait was made of however, it wasn't ice cream as it didn't melt, but it was thicker than a cream ... fascinating. Anyway, a good dessert, but it paled in comparison to my pick. Banana & Black Sticky Rice Sundae. $16. OMG. That just about sums this up. Yes, that is the simple "banana and black sticky rice sundae". Um, wow. Sure, the descriptions throughout the entire menu were understated, and didn't quite do the dishes justice. But this one takes the cake in under-promising and over-delivering. This was most certainly not just banana and sticky rice! In fact, where were the banana and sticky rice even hiding in here? I don't even know where to begin. Which, incidentally, is also how I felt when it was placed in front of us. It was huge. Massive. Remember how we just wanted a little bite of sweet to finish. Oops. Maybe Pinebone should add smaller "dessert snacks" to the menu. So, let's start with the menu description, which said there should be black sticky rice. Where was it? It formed the bottom layer of the dish, underneath all the other ingredients. It was slightly al dente, which gave a pleasant crunch. A great textural element, but it was more of a garnish that I was expecting, given that the dish was named after it. The other element listed on the menu was banana, and in the center of the plate was a scoop of banana ice cream. I'm actually not a huge fan of banana, so I wasn't enamored with the flavor, but it was perfectly soft and creamy, and reminded me of great gelato. It was really, really well done. Speaking of banana, there were also banana chips for more crunch and soft ripe banana slices. And fresh strawberries. And ... warm waffle pieces, almost halfway in-between waffle cone and regular waffles, as they were thin, but not crispy. There was also a powder of some sort. And ... little crunchy things that we thought were mini cookies, perhaps with macadamia? But after reading other people's posts I think they might have been walnuts coated in malt? I have no idea. Again, awesome crunch. Then there was a cream, or mousse, perhaps white chocolate, perhaps caramel? I couldn't tell, but it was sweet, fluffy, and delicious. Speaking of sweet, the final component was disks of caramel, again crispy. This was incredible. So many textures, so many flavors, and quite fun to eat. 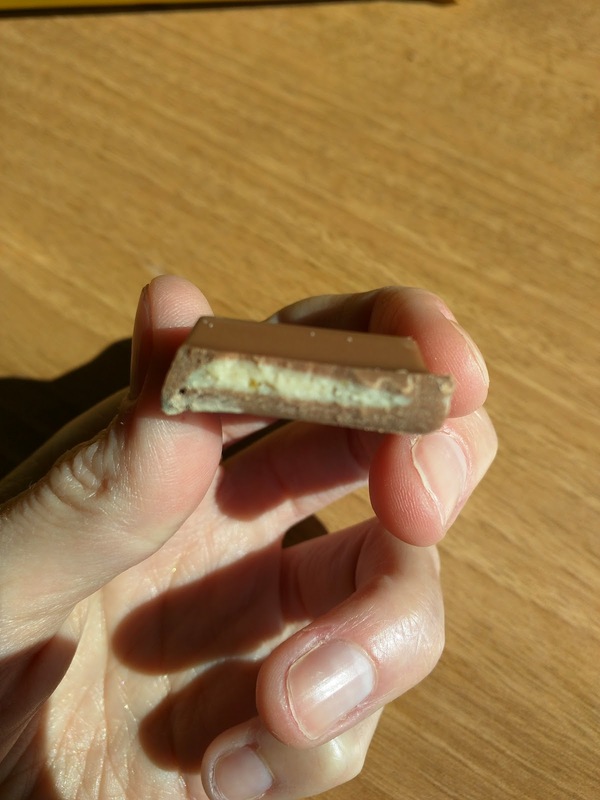 You could combine elements in whatever way you wanted to make that "perfect bite". For me, it was sticky rice, cream, crunchy cookies, and the crunchy caramel. I didn't really need the additional banana components, nor the waffle. But, that was the beauty of the dish, everyone could combine it how they wanted. The playfulness of the snacks we opened with shone through again here. An impressive finish to an already impressive meal, and the best dessert we had in Sydney. I wish I could go back again, now. I've mentioned before that my friends and co-workers are all awesome, and regularly bring back chocolate whenever they travel, like Studentská and Milka from Slovakia and Läderach and Cailler from Switzerland. 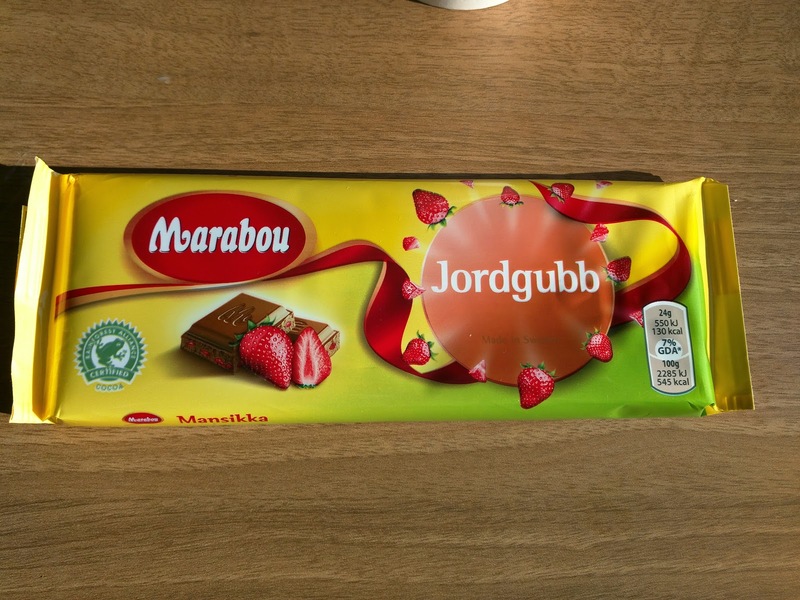 Today's offering came from Emil, when he returned from Sweden, and, in true Emil style, he brought back a number of different bars to try from Marabou, a brand I had never heard of. If I lived in Sweden however, I certainly would be familiar with the brand, as they have been around since 1916. 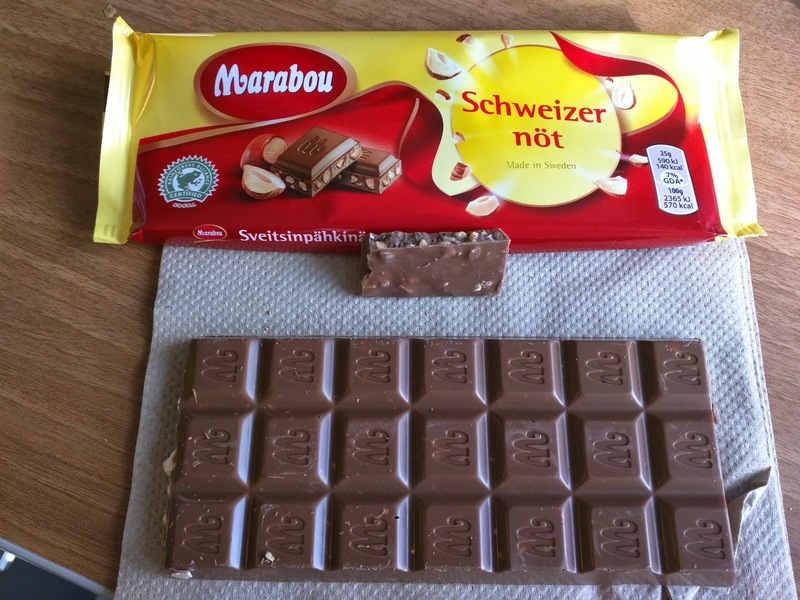 It sorta seems like Sweden's Cadbury or Hershey, and is even owned by Kraft at this point. Anyway, I tried a slew of the bars, and, for the most part, they weren't really my style, mostly because the selection was all milk chocolate, and I prefer darker chocolate. The mix-ins were fascinating though, and, for milk chocolate, it was good. 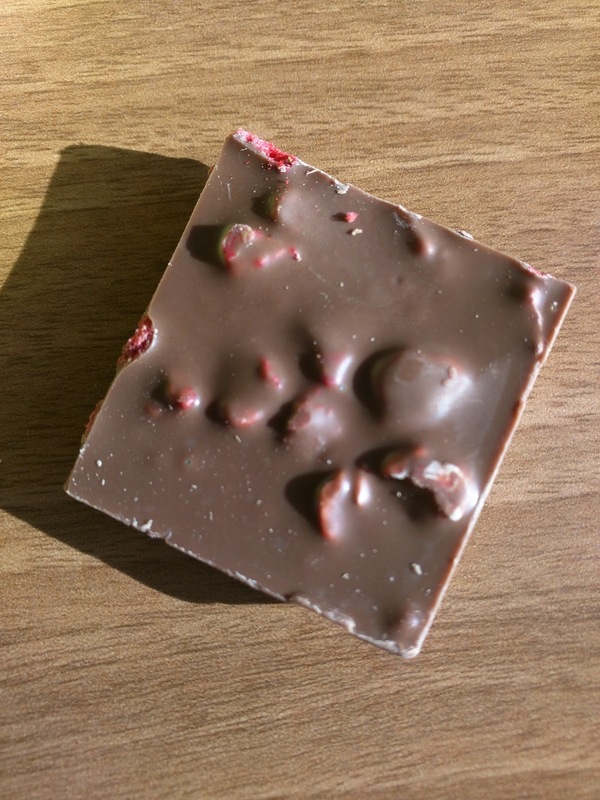 "Swedish Classic Milk Chocolate with pieces of strawberry in bar". Not something I'd normally purchase, but, it sounded interesting, like a chocolate covered strawberry perhaps? The chocolate was creamy enough, milk chocolate. As you can see, there were chunks of dried strawberry embedded throughout. The taste was instantly familiar: Carnation Instant Breakfast, strawberry flavor. So fake tasting. Another taster's first remark: "There is certainly something artificial in here!" However, one of my co-workers really did enjoy it, so, clearly, to each his (or her) own. This had the same base mediocre milk chocolate, loaded up with little bits of chopped hazelnut. Since I don't like hazelnut, this wasn't very appealing to me, but my co-workers quickly devoured it. I did appreciate the crunch of the nuts at least. 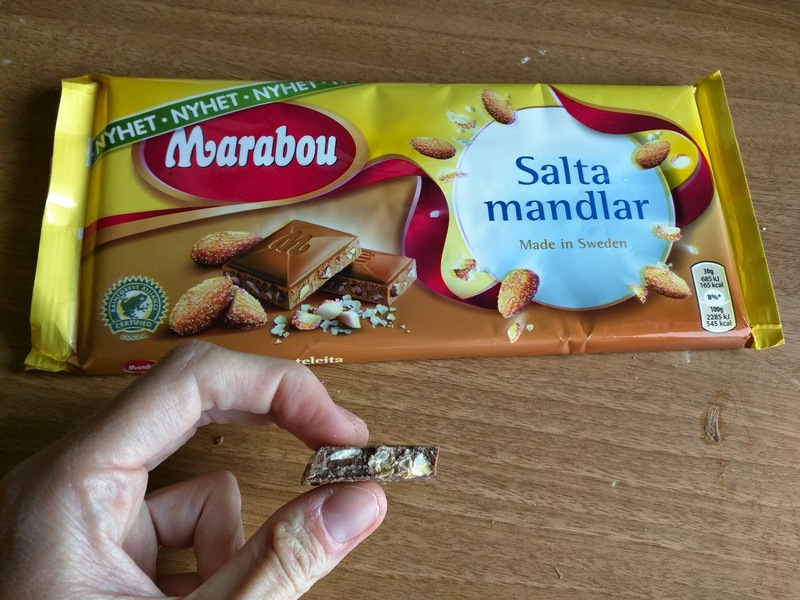 "Milk chocolate with roasted caramelised salted almonds." Next was another nutty offering, this time with bits of almond. I again appreciated the crunch of the nuts. They didn't taste caramelized or salted as promised though. The milk chocolate however did start to grow on me. I found it creamy and as enjoyable as I was ever going to find a milk chocolate. 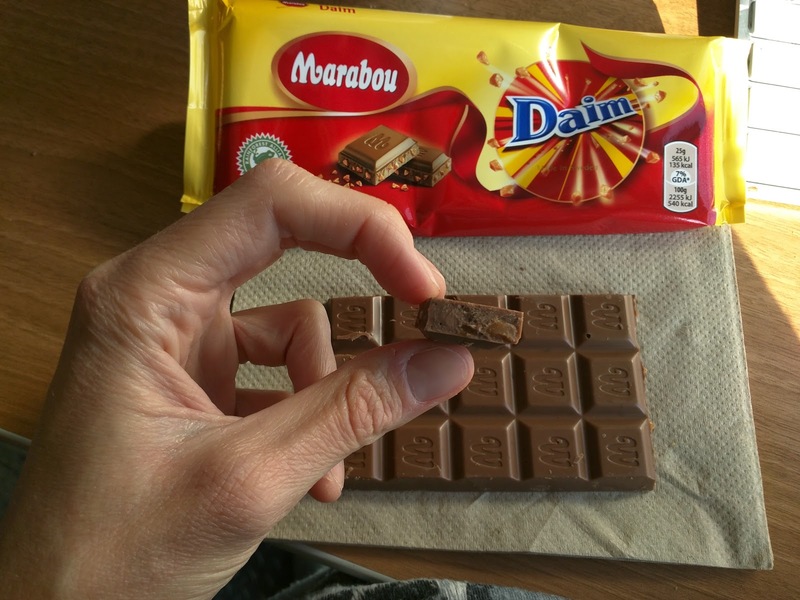 "Milk chocolate with pieces of Daim.". Uh, what is Daim? The internet seems to say "crunchy butter almond". To me, it seemed like toffee. And, indeed, it basically is. Further digging reveals that this was there attempt at making something like Heath Bar. This was the best so far, but, my second favorite overall. Creamy milk chocolate, with a sweet crunch from the bits of Daim. I liked the crunch, I liked the sweetness. 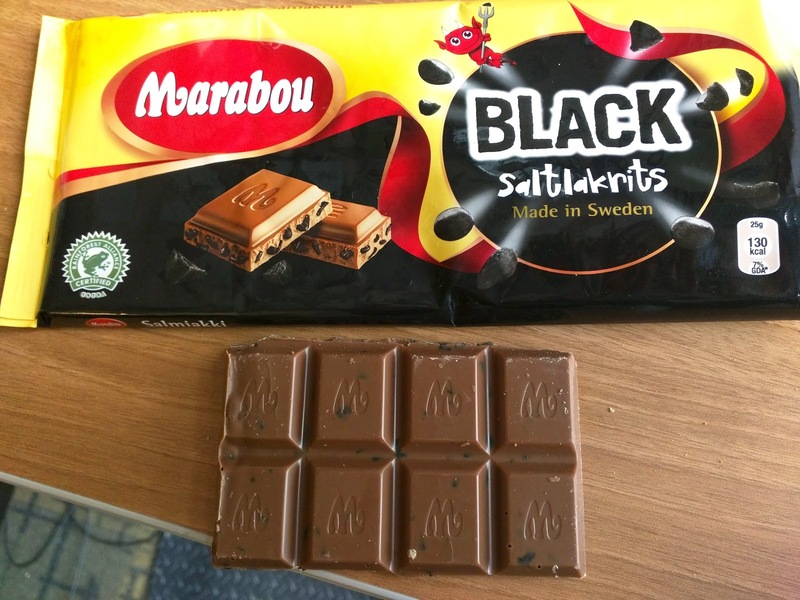 "Chocolate bar with Salty Licorice"
Ok, now we were talking. I adore salty licorice. I've had some decent chocolate coated licorice, so it wasn't strange to me to combine them. This was pretty great. Creamy milk chocolate. Crunchy bits of licorice. Yes, crunchy. This wasn't soft, candy-style licorice, it was hard, pure licorice. Super intense. Salty. Bitter. Sweet from the milk chocolate. All at once. Definitely my favorite bar, and a unique set of flavors and textures. "Milk chocolate filled with hazelnut nougat, crisps and salt." The milk chocolate on the outside was very creamy. 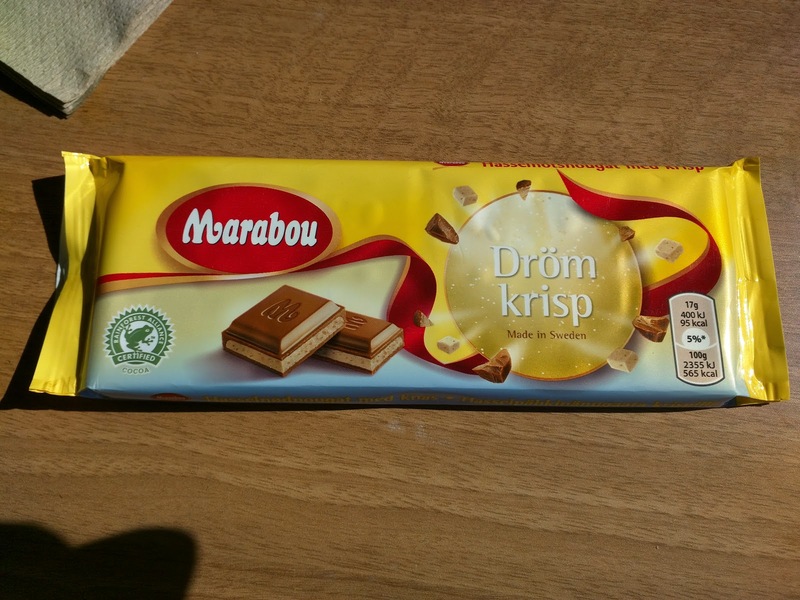 Again, I don't really like milk chocolate, but for creamy milk chocolate, it was excellent. The filling was slightly sweet, slightly crispy, and only a tiny bit hazelnuty. If I hadn't read the description, I certainly wouldn't have known it was supposed to be hazelnut. I didn't taste any salt. Overall, this was fine. Great milk chocolate, nice texture, but if you were really wanting hazelnut, it would likely let down.